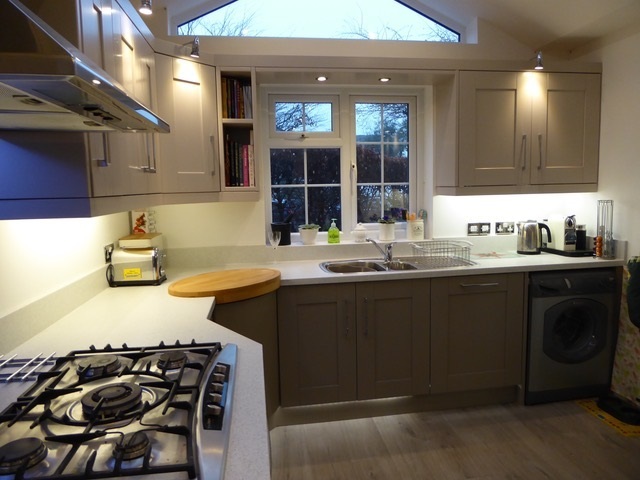 These slideshows show six of the kitchens we have previously transformed. 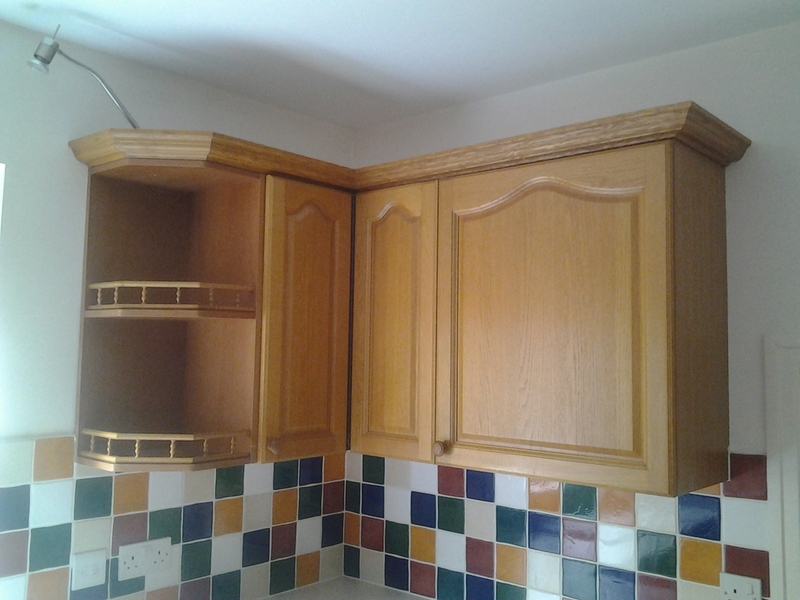 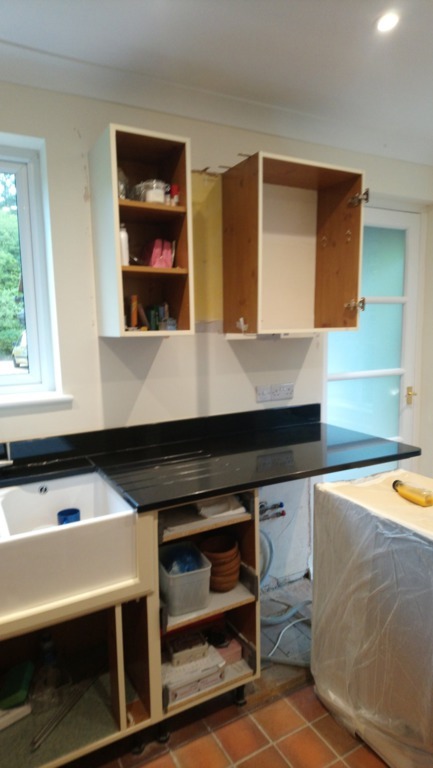 Most kitchens are removed on a Monday and refitted either on the Friday of the same week, or early the following week. 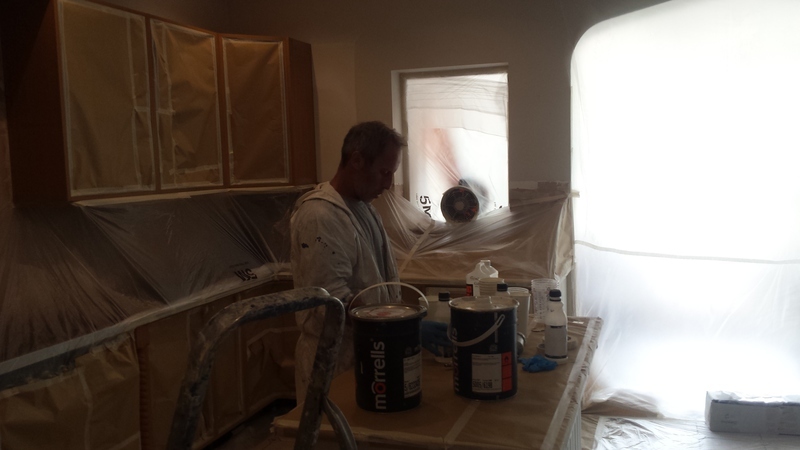 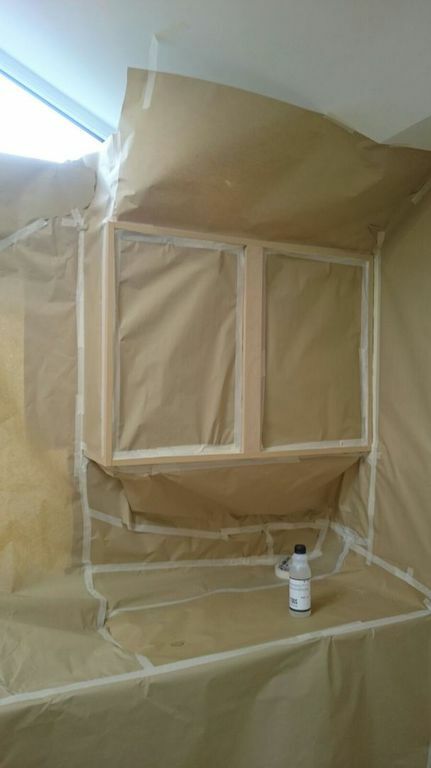 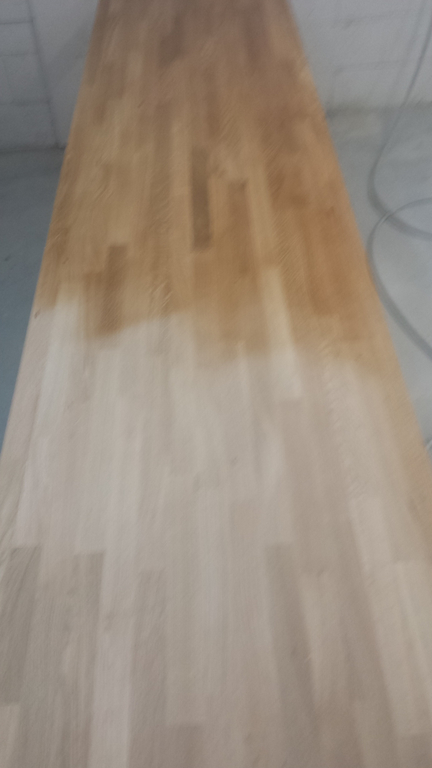 The on-site spraywork averagely takes our team around 6 hours on one mutually convenient day in the middle. 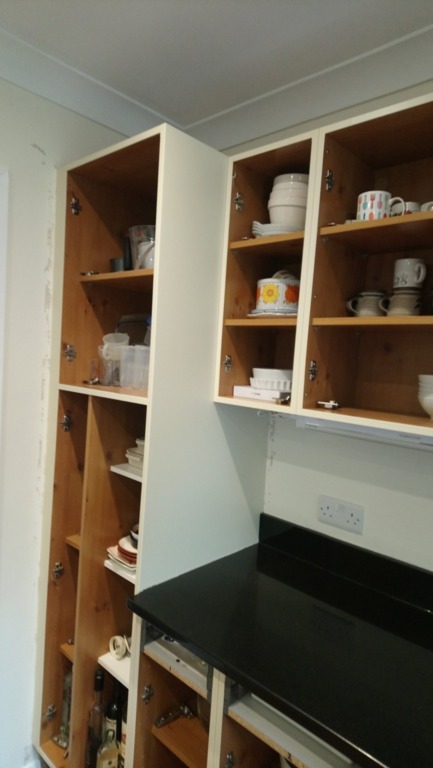 The paint is totally dry and the area clean & tidy before our team leave, enabling you to continue using your kitchen that evening. 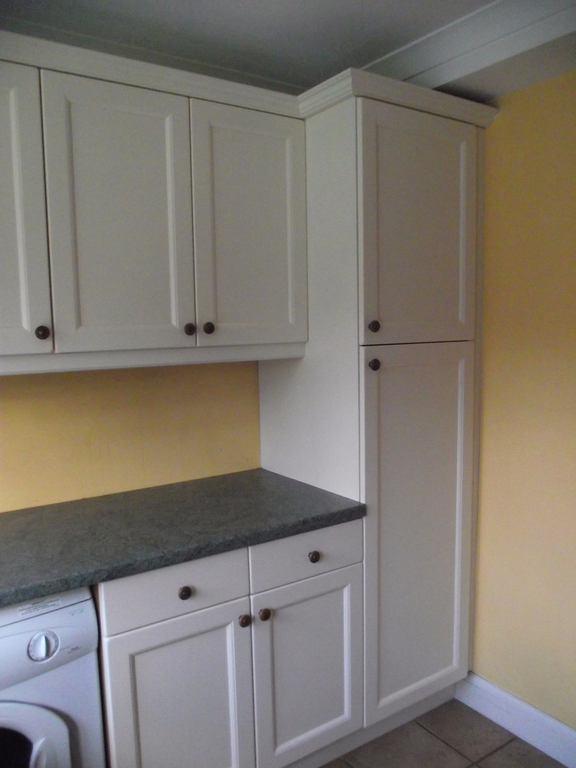 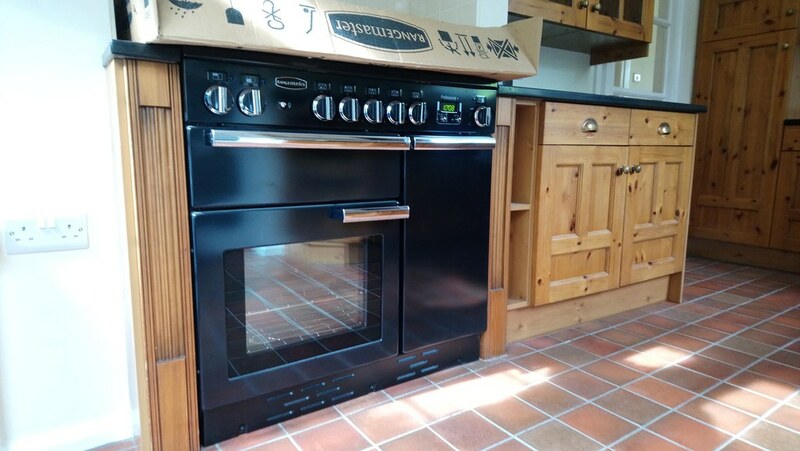 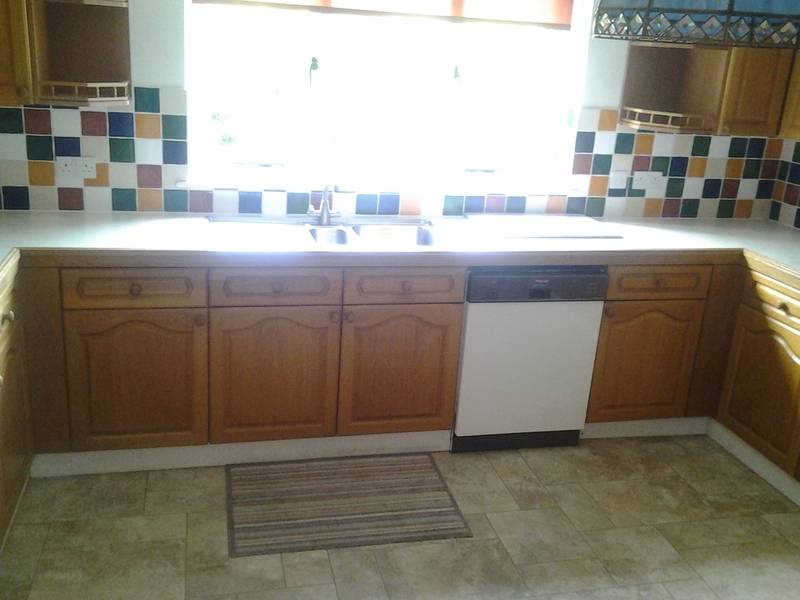 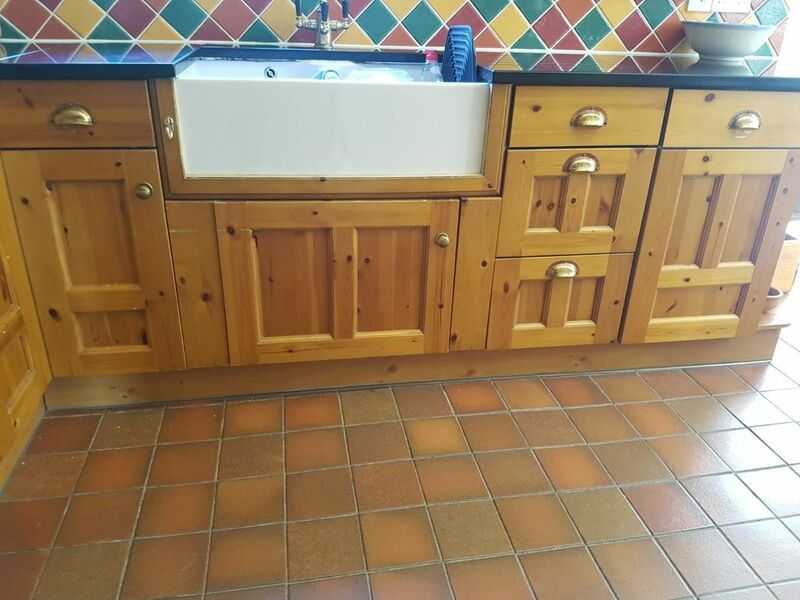 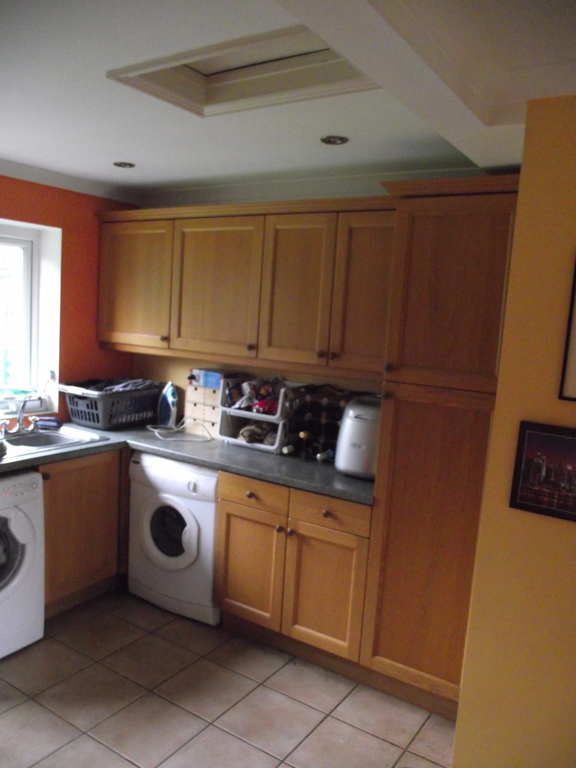 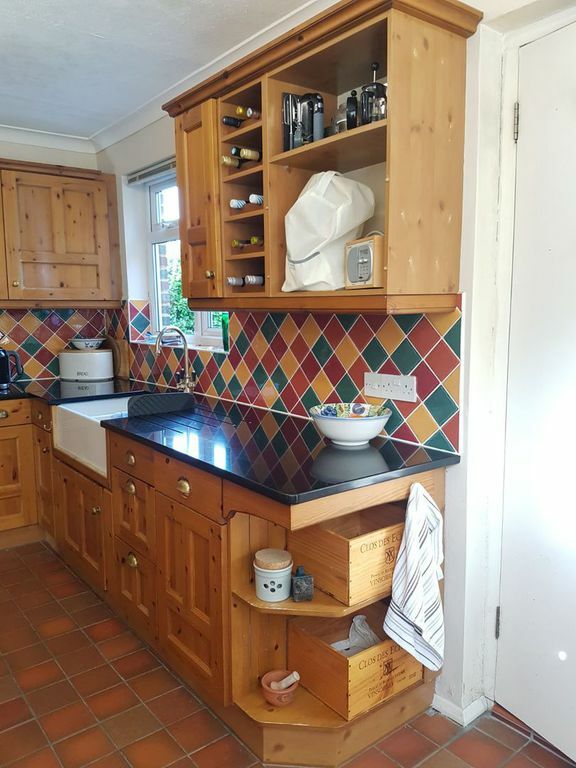 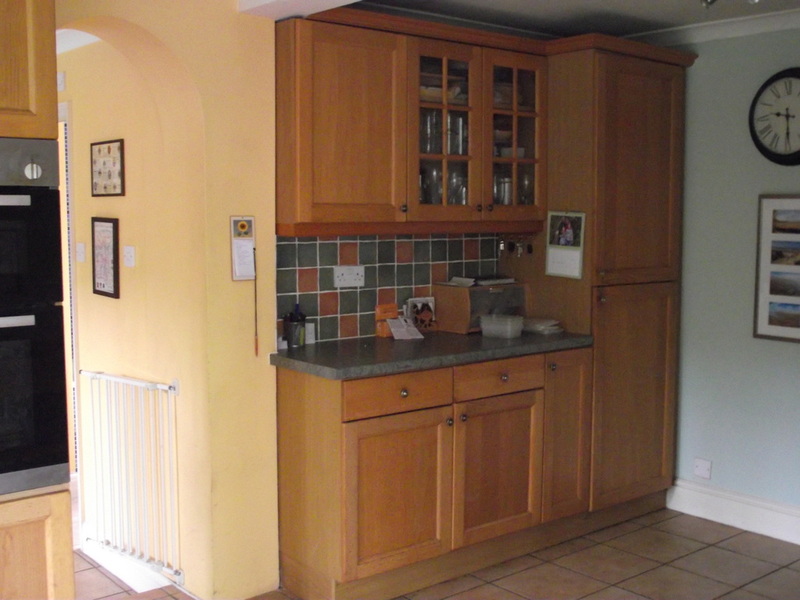 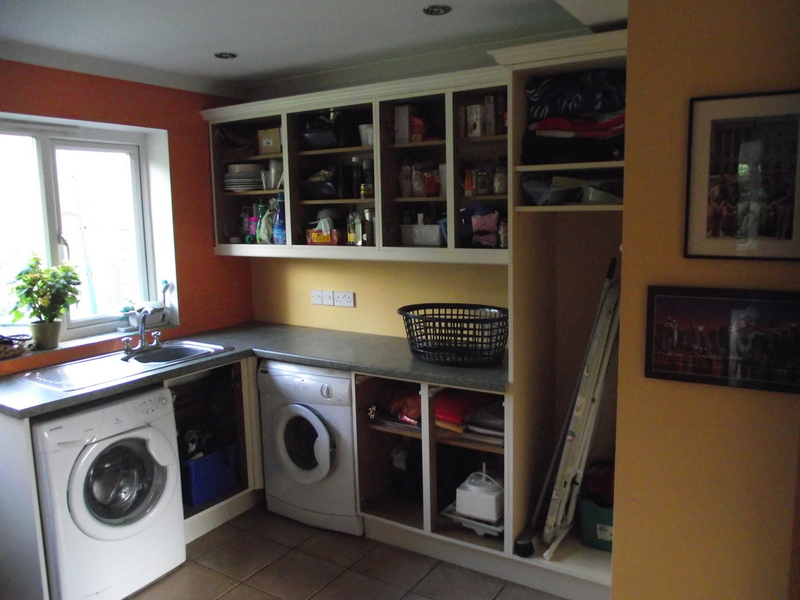 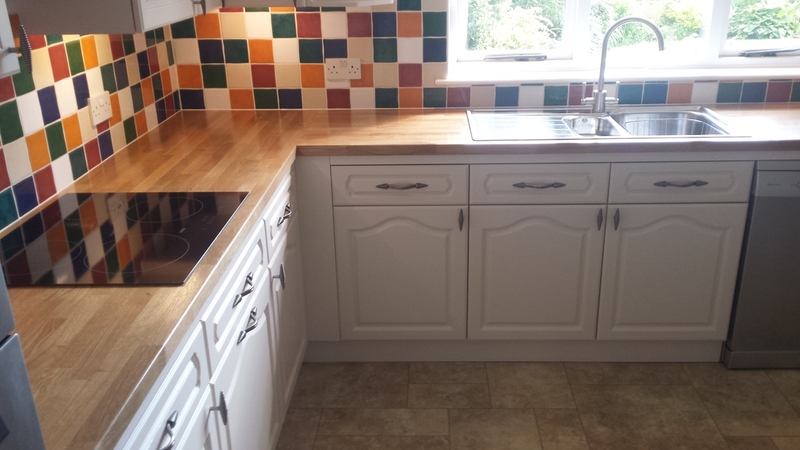 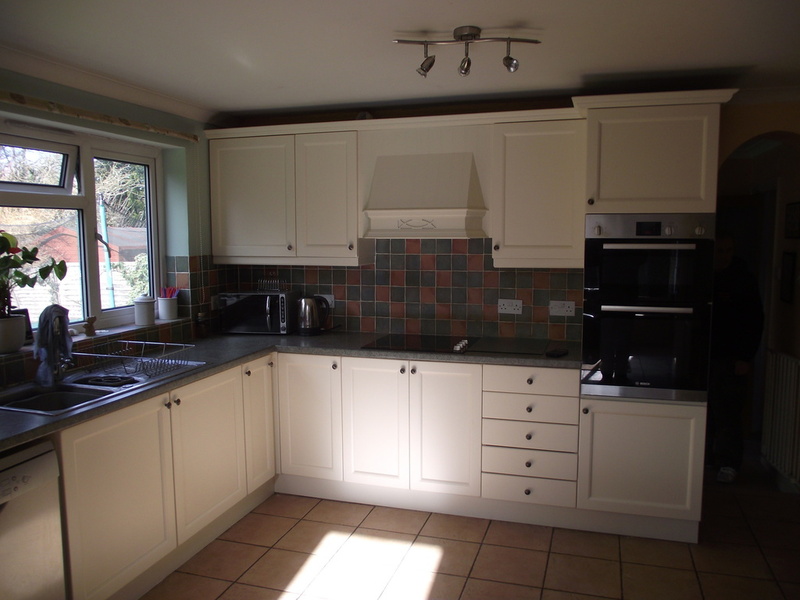 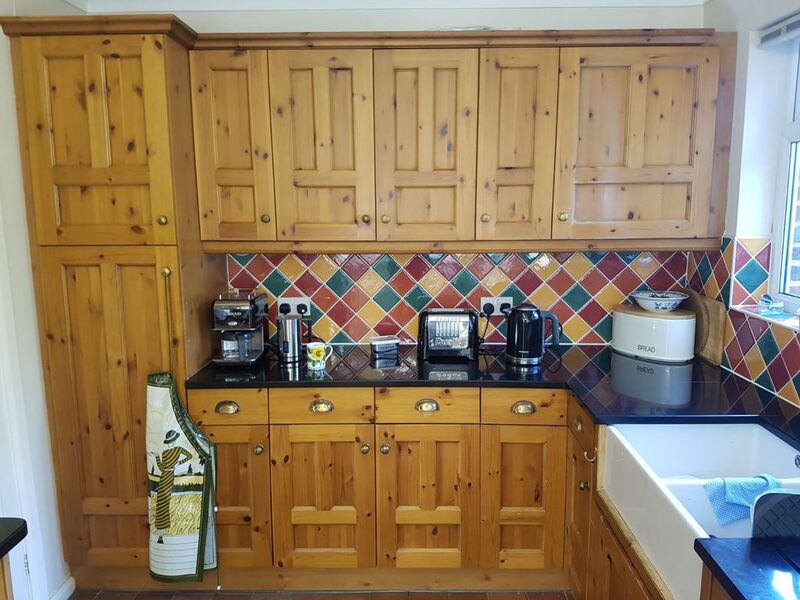 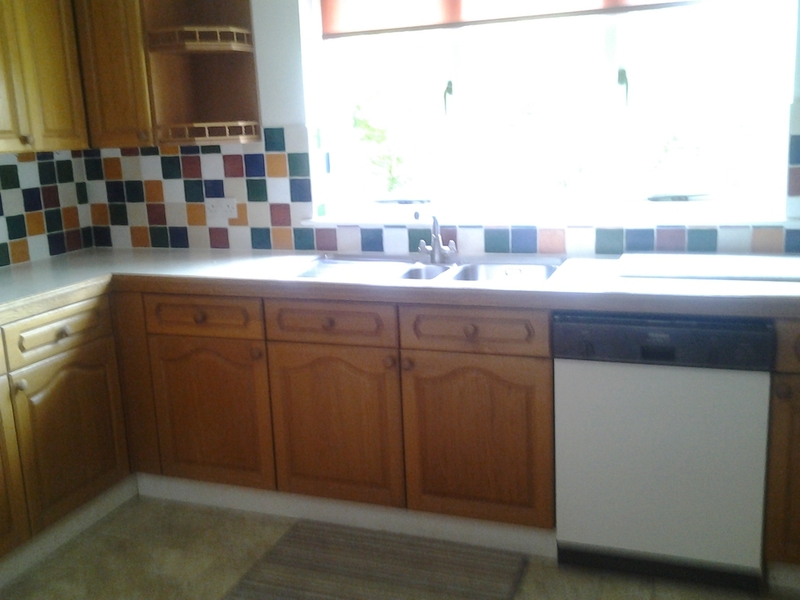 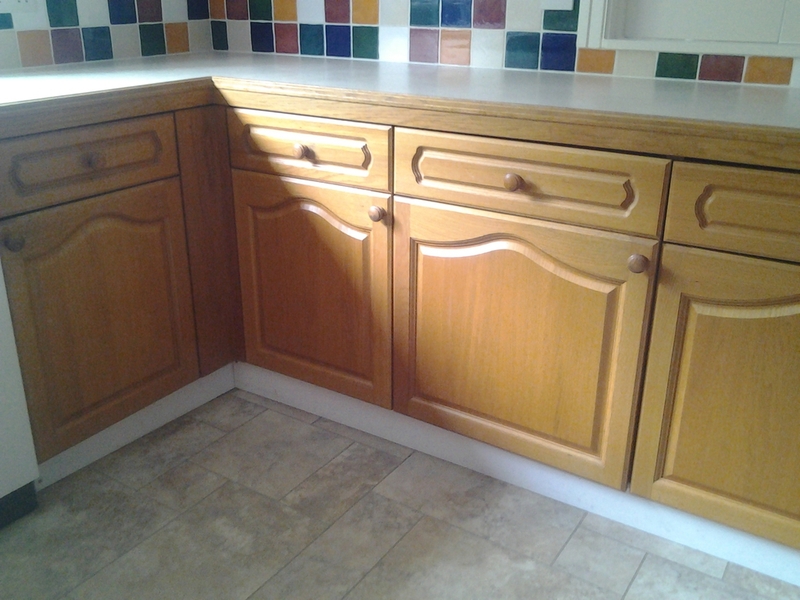 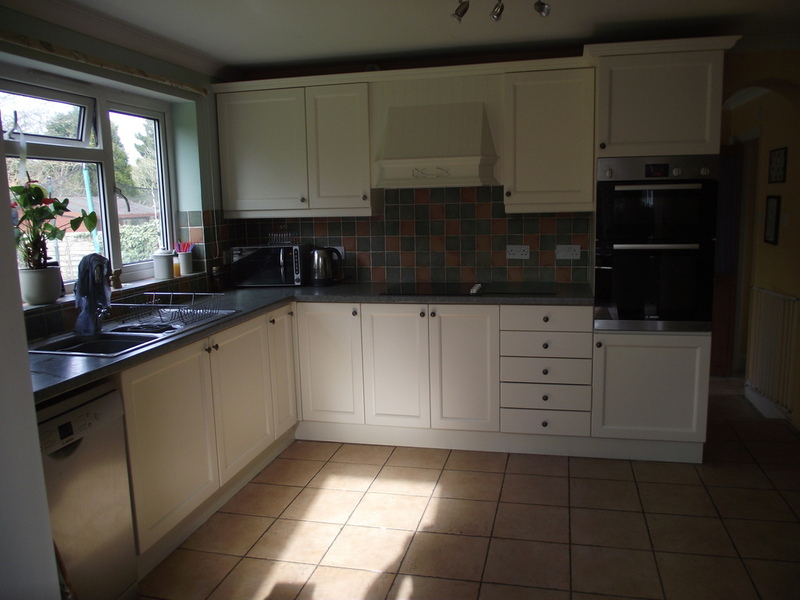 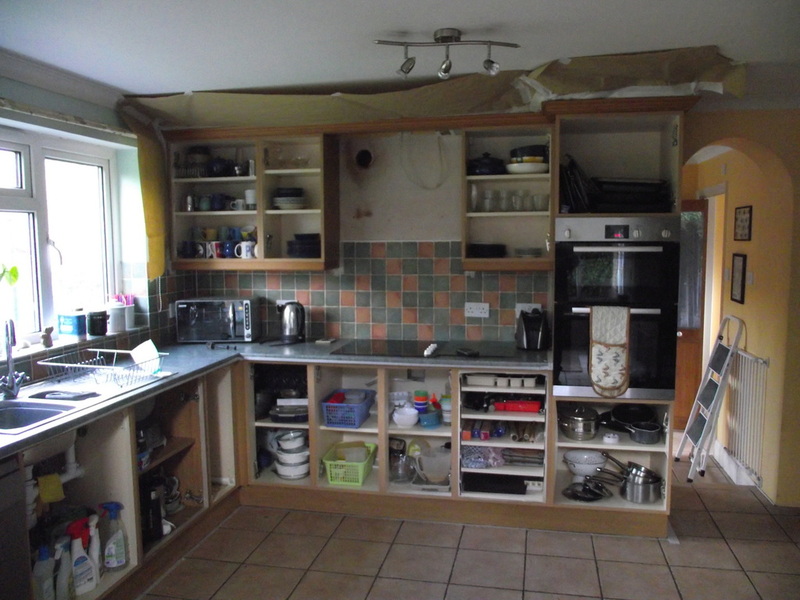 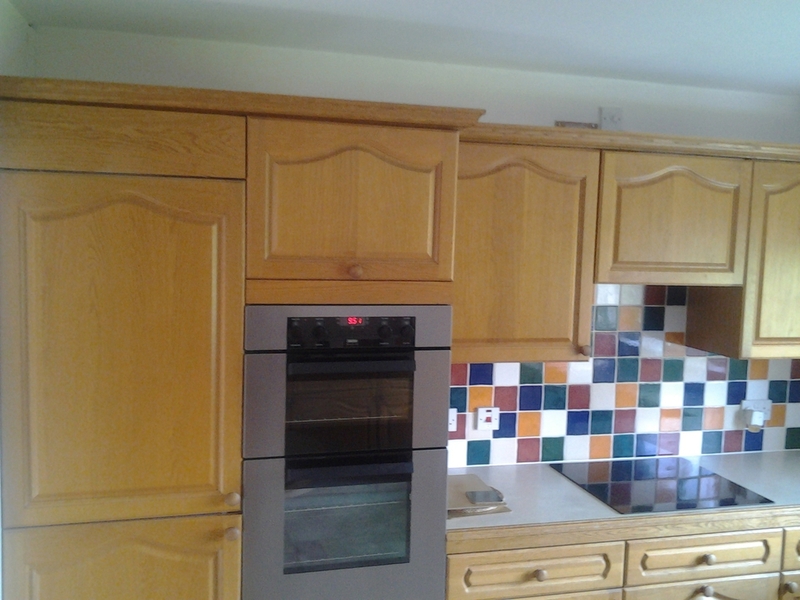 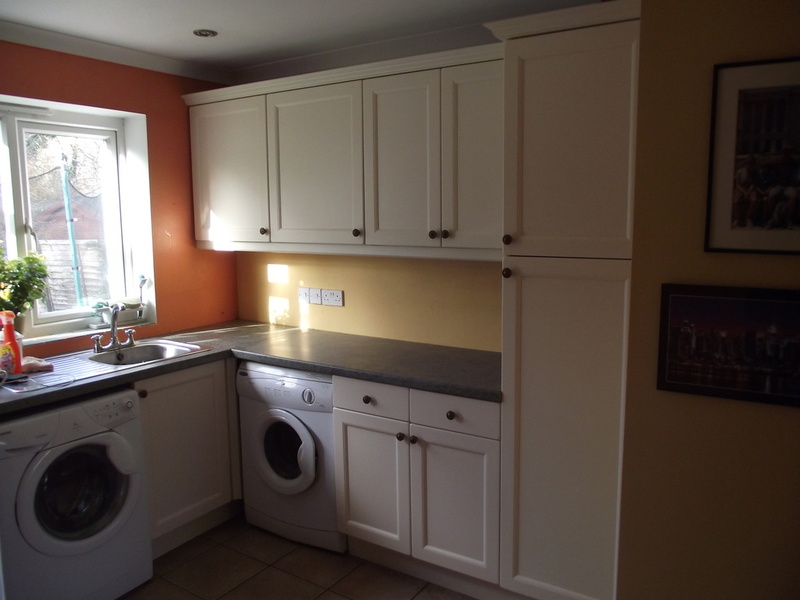 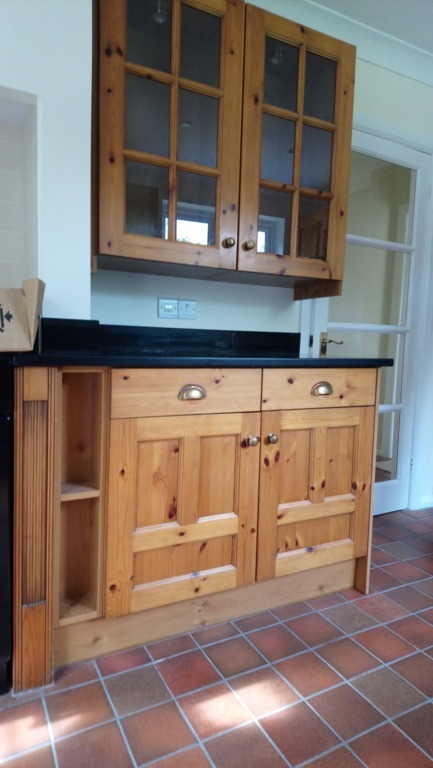 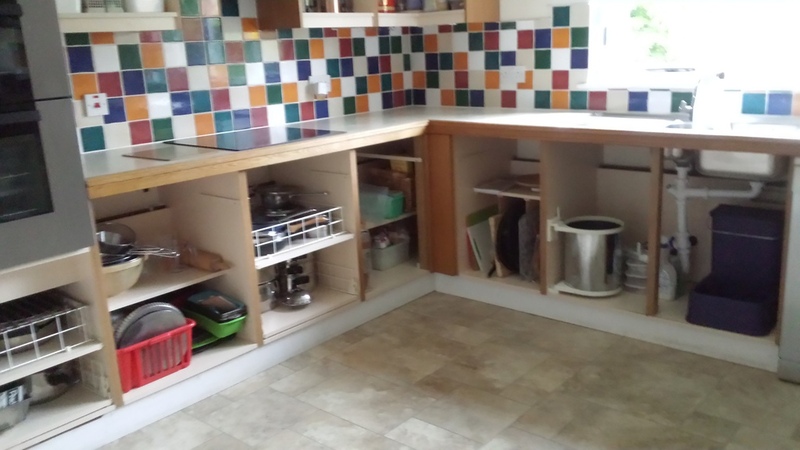 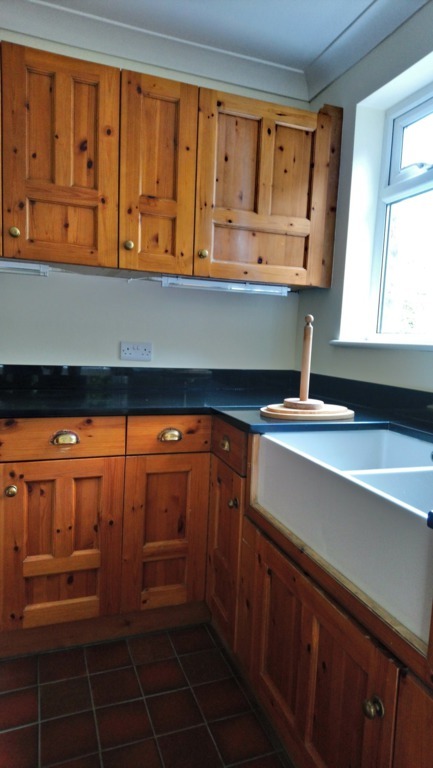 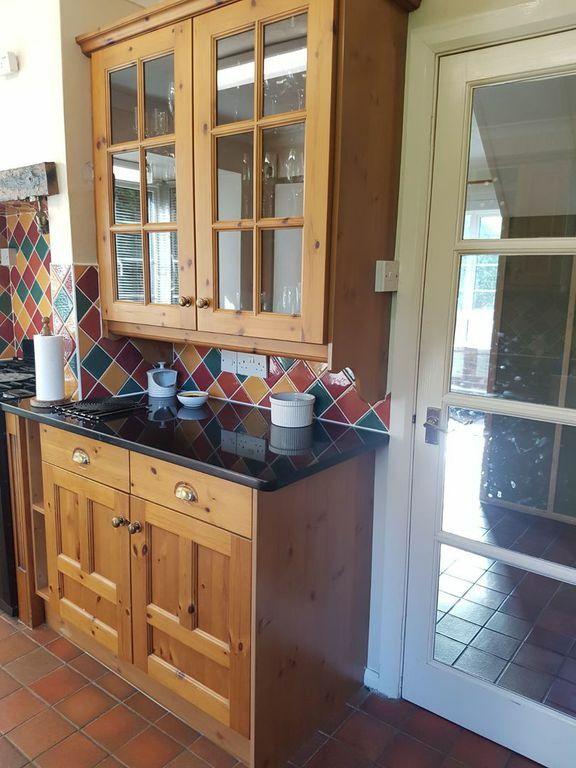 The before, during & after photos in the slideshow below, show a kitchen we recently transformed in Storrington. 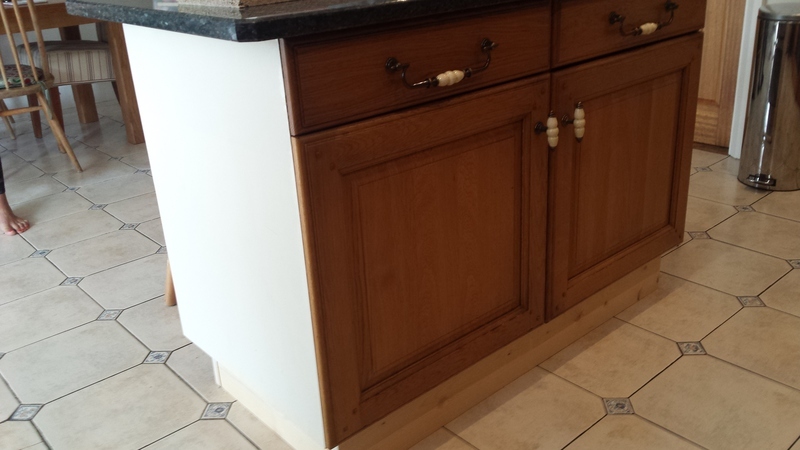 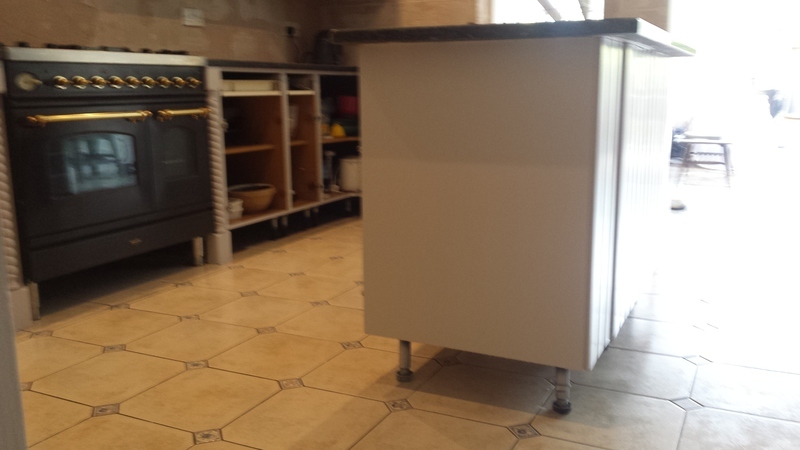 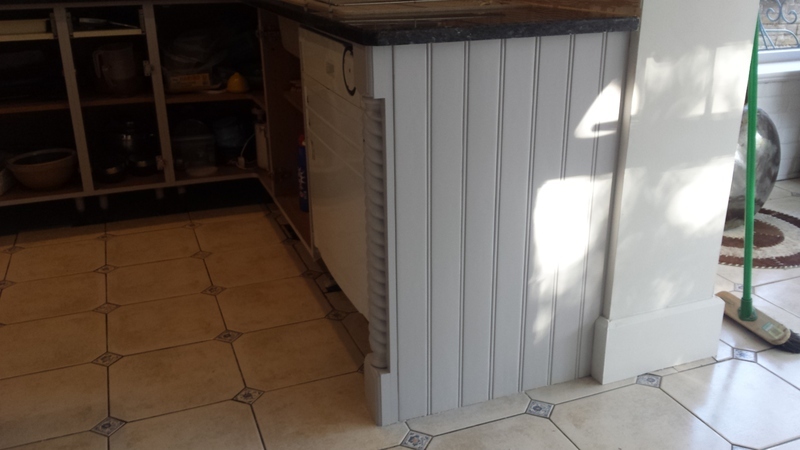 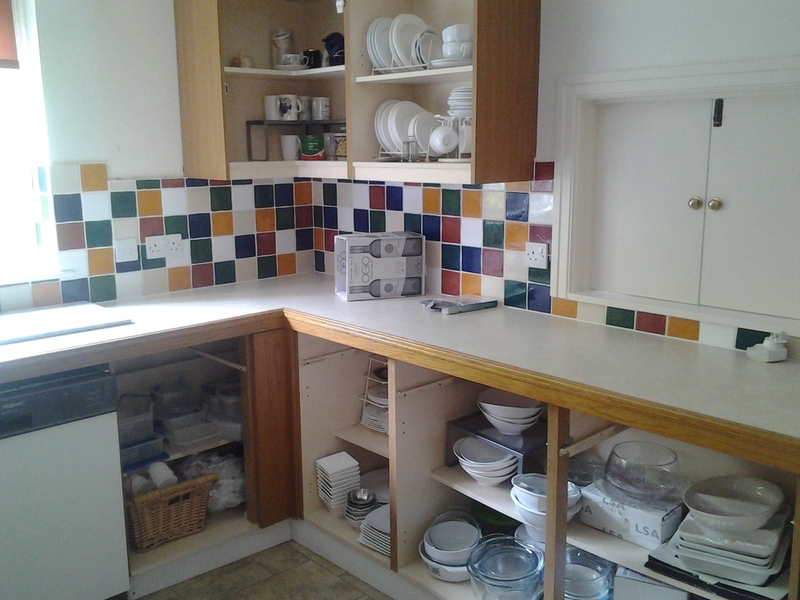 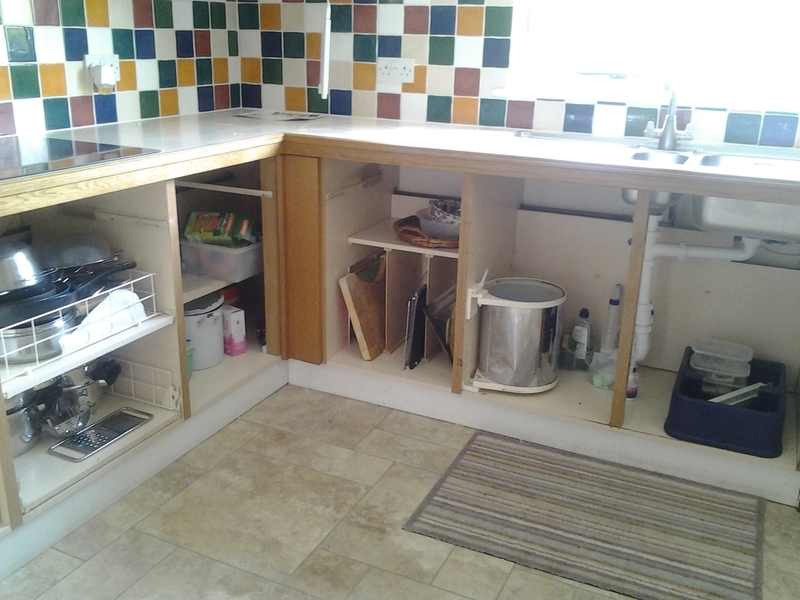 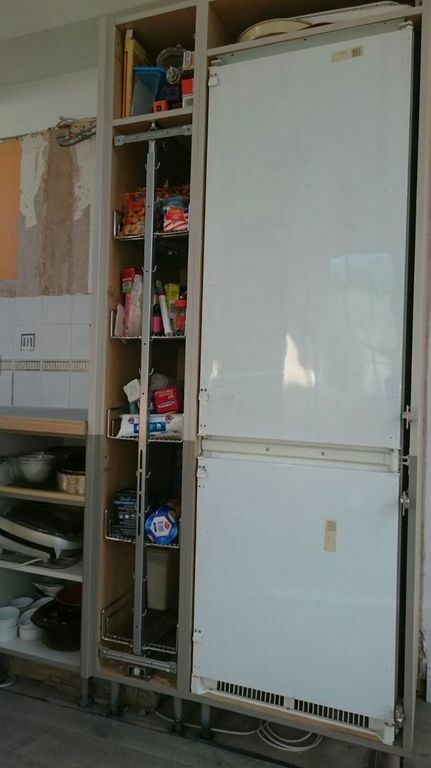 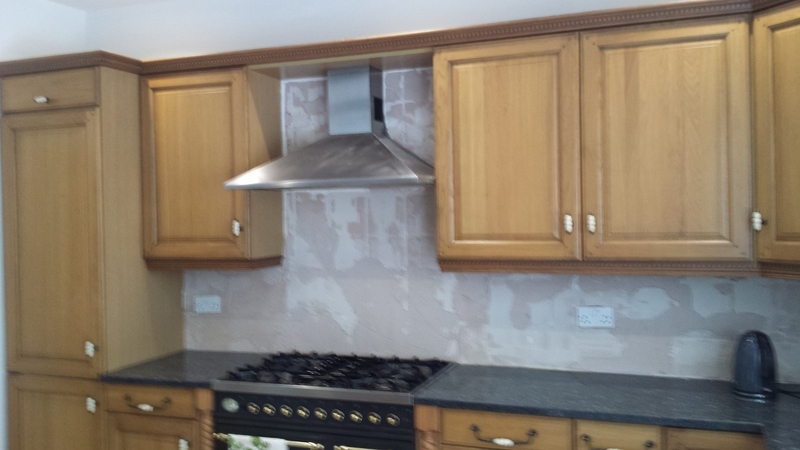 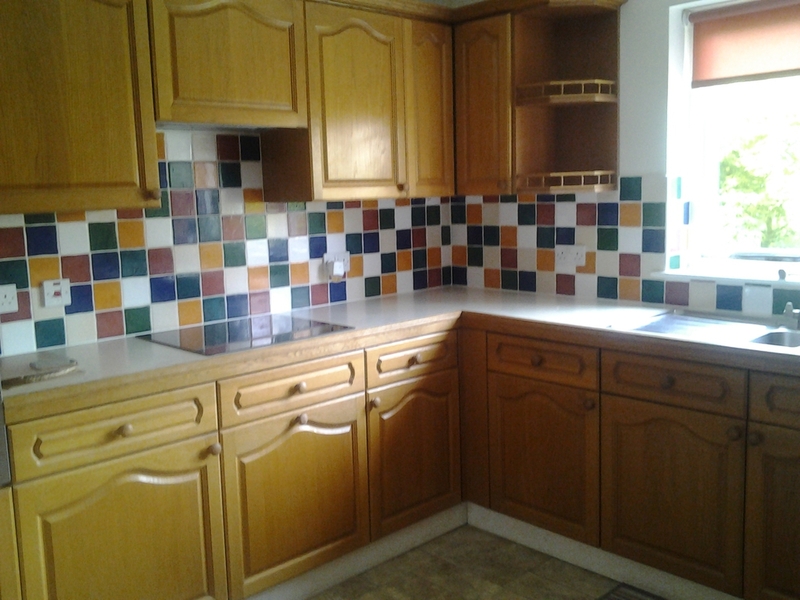 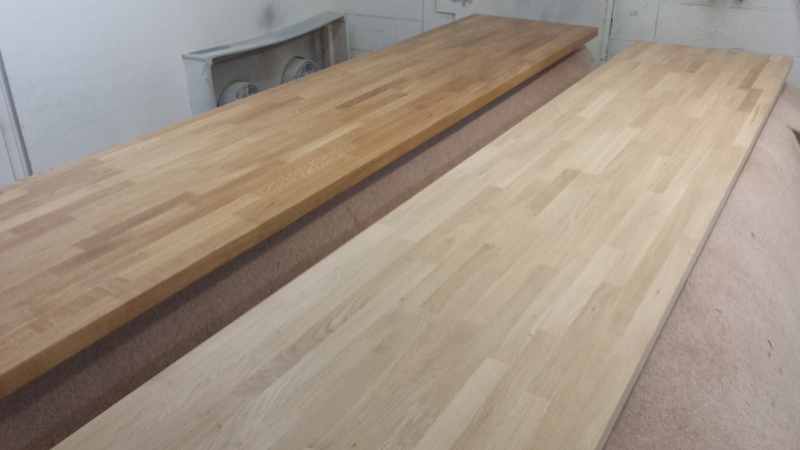 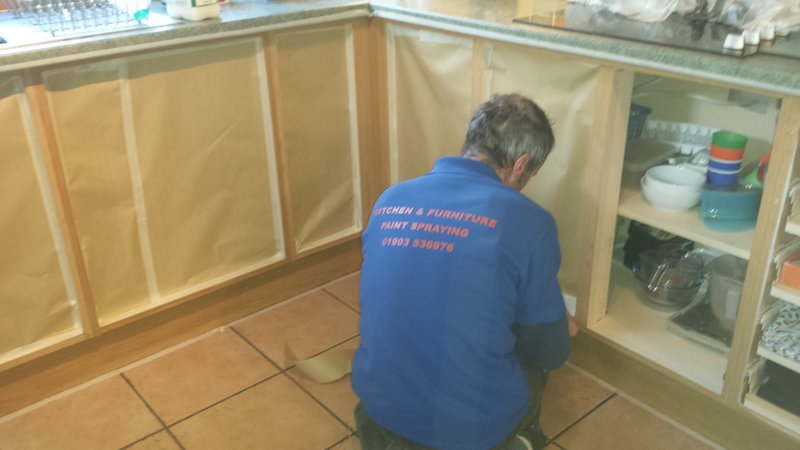 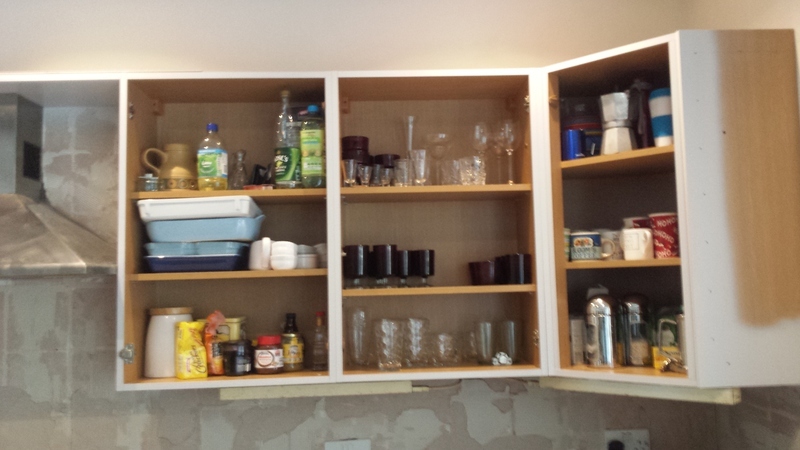 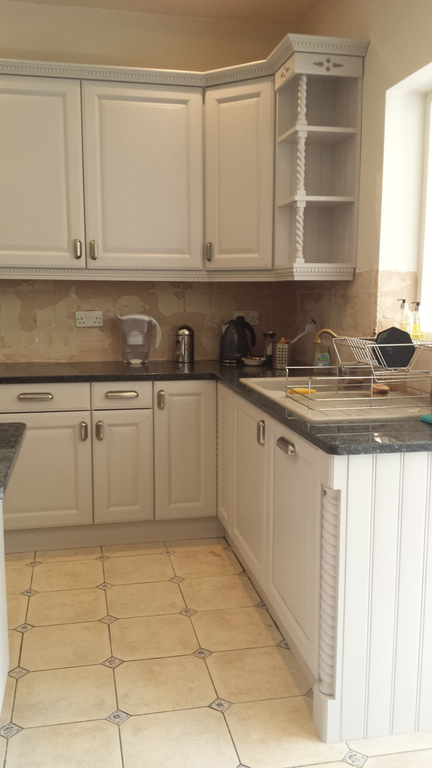 Our customers had their tiles removed and upstands added to their kitchen prior to us starting. 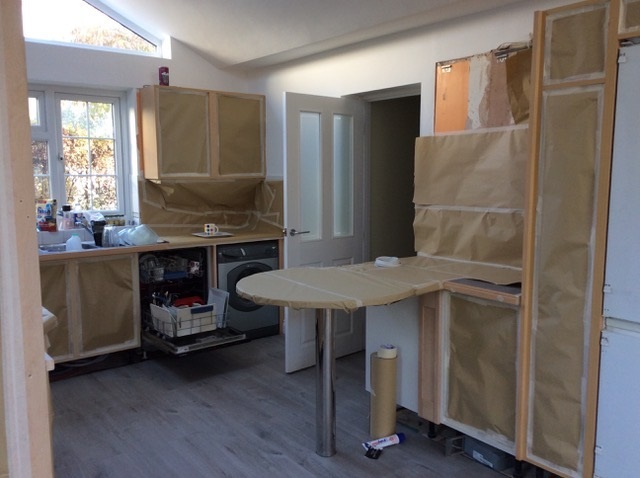 Our paint was colour-matched to Farrow & Ball's Matchstick and our team sprayed the doors & drawer fronts as well as on-site spraying of non-removable sections (end panels etc). 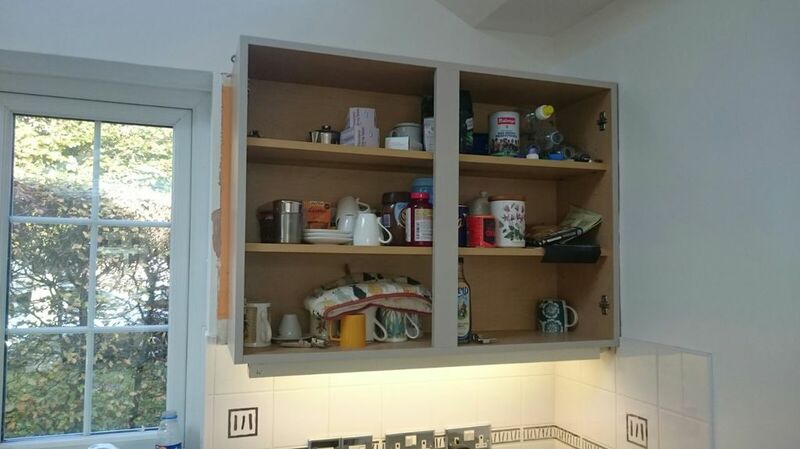 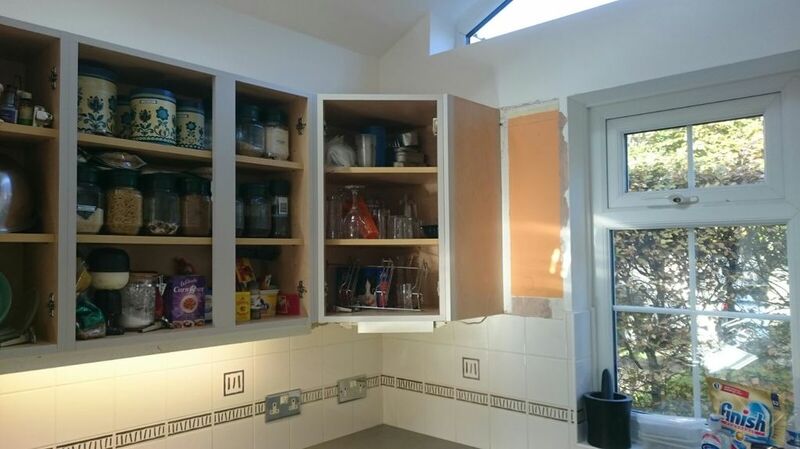 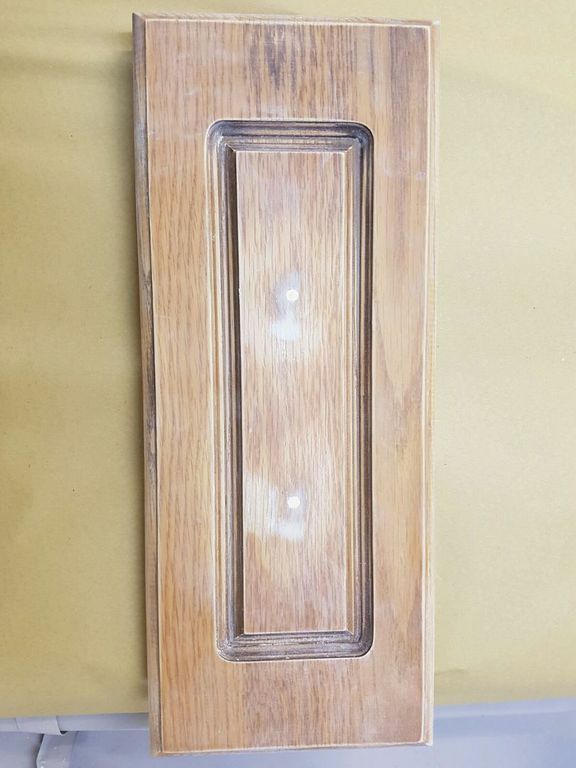 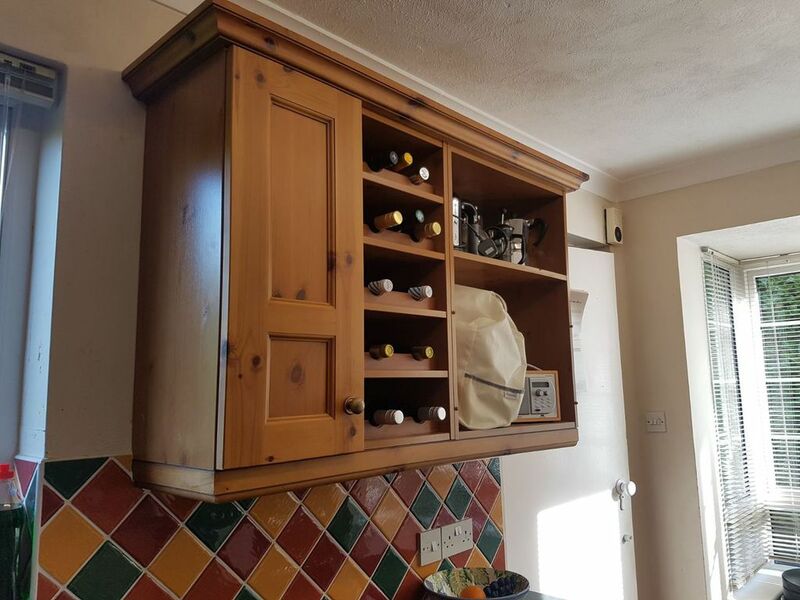 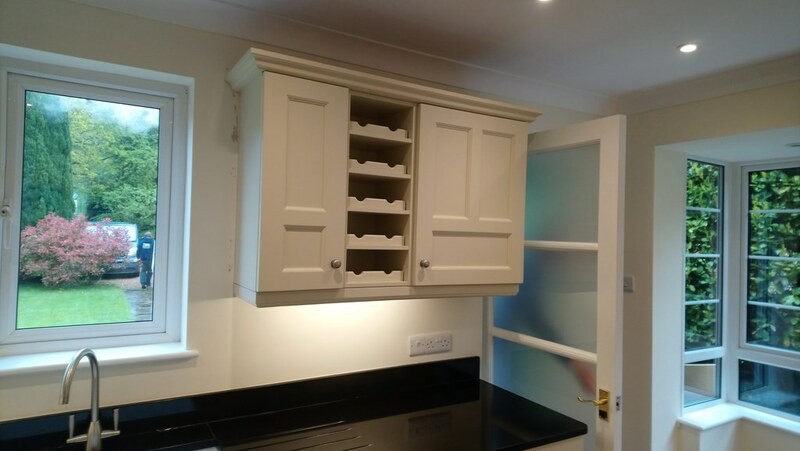 We filled in the existing drawer handle holes, and fitted knew cup handles, and fitted new knobs using the existing holes on their doors. 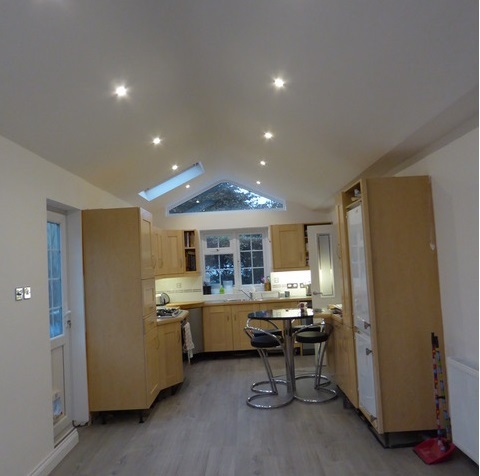 As you can see from their testimonial, they are delighted with the transformation! 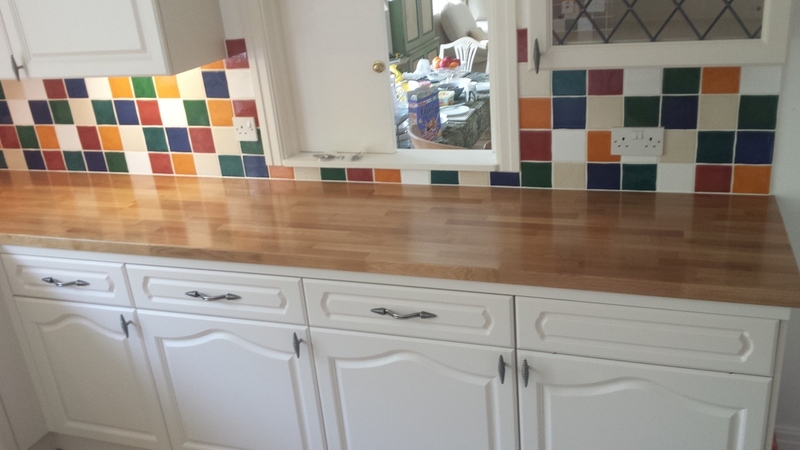 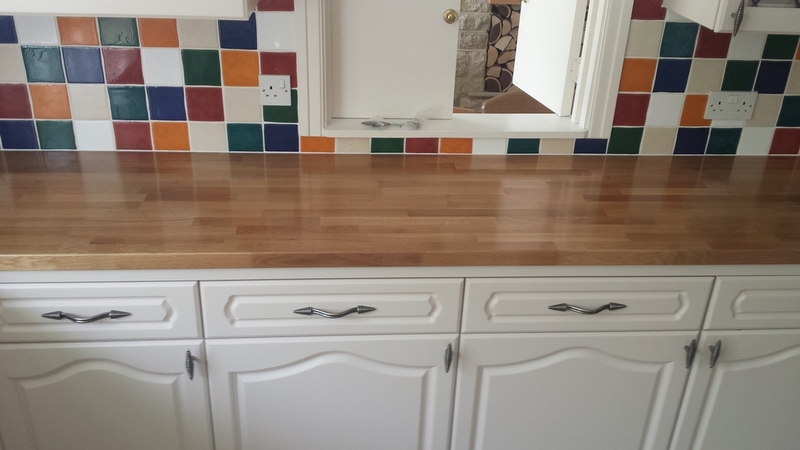 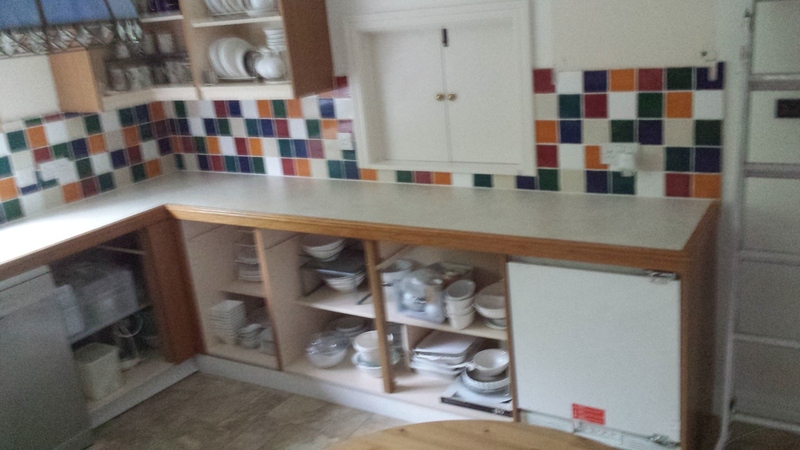 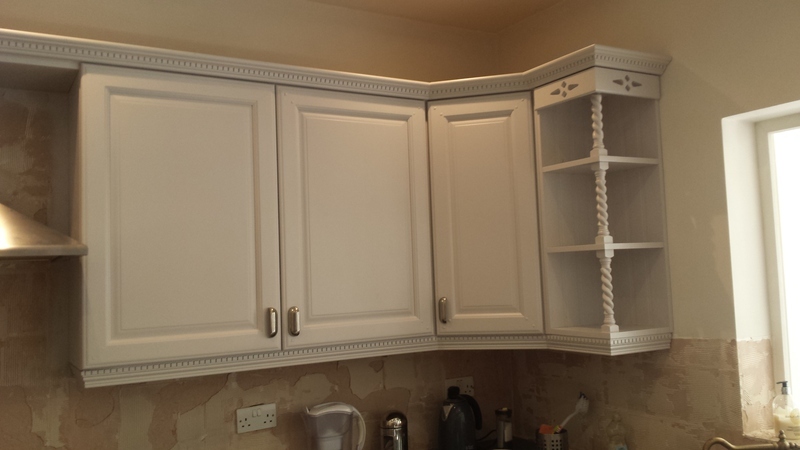 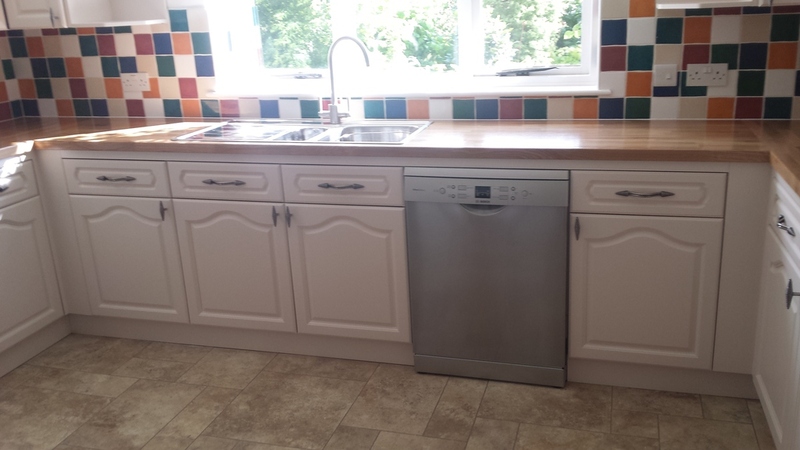 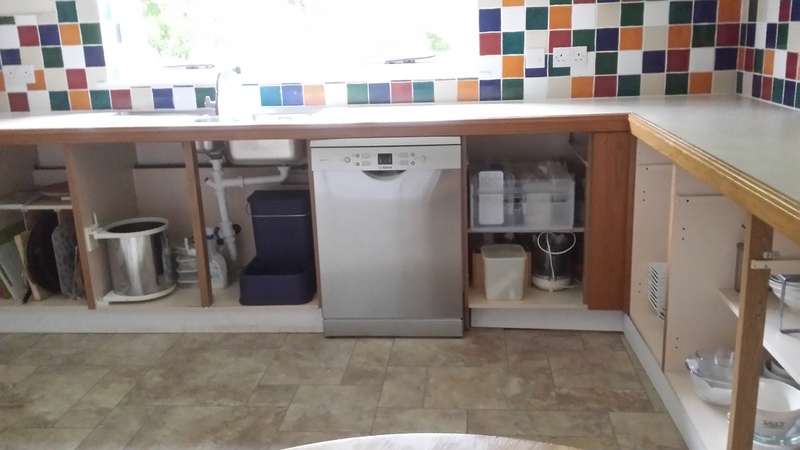 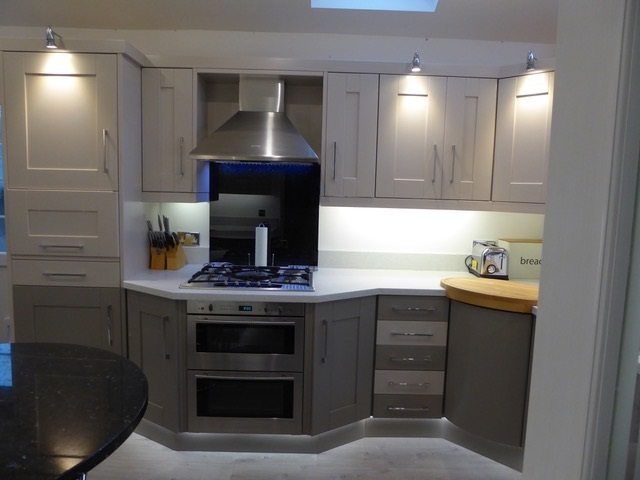 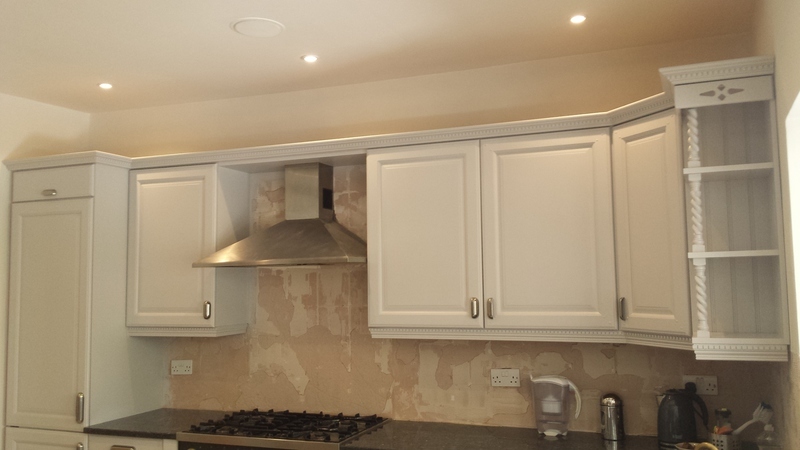 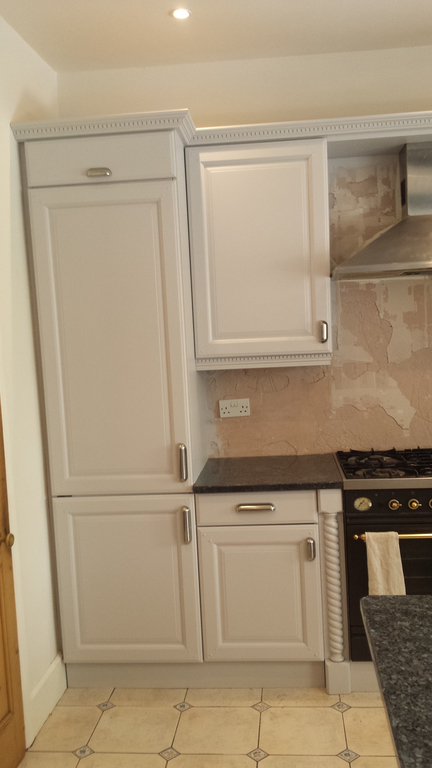 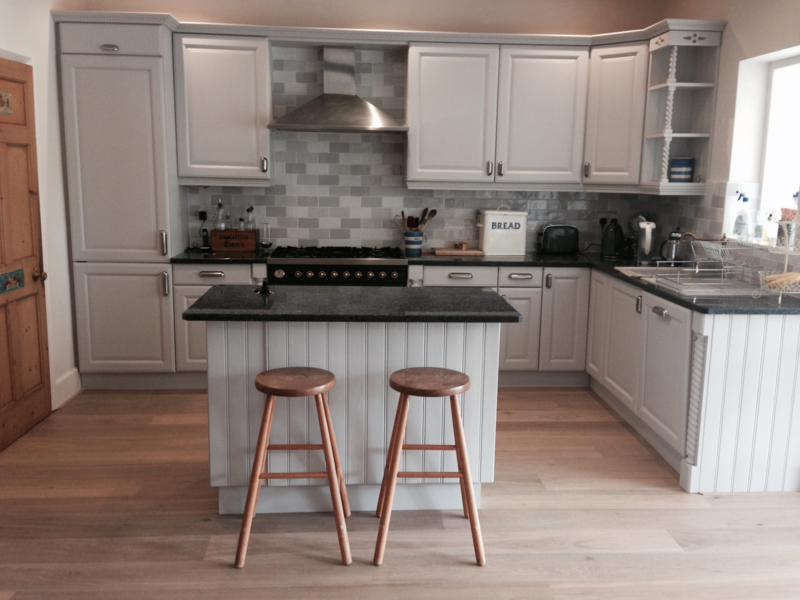 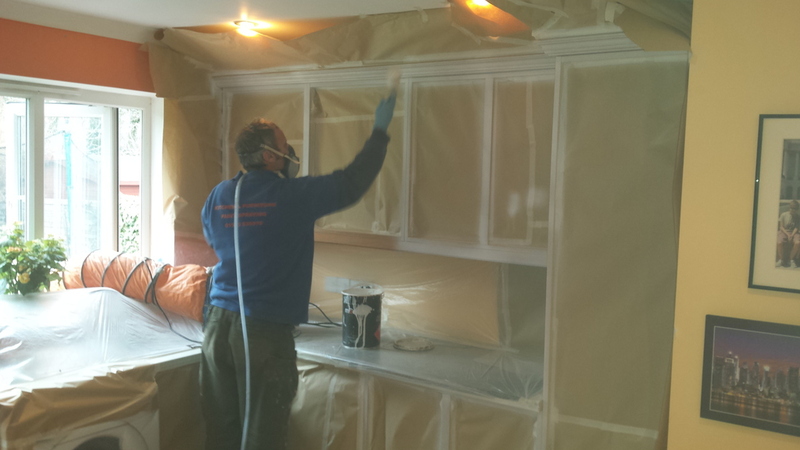 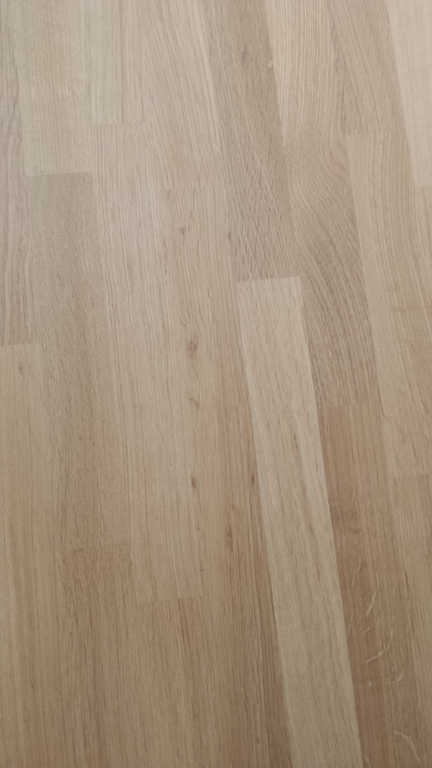 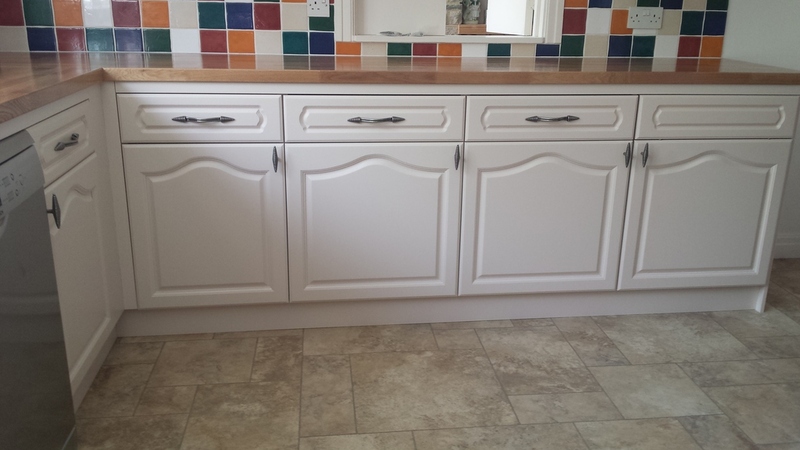 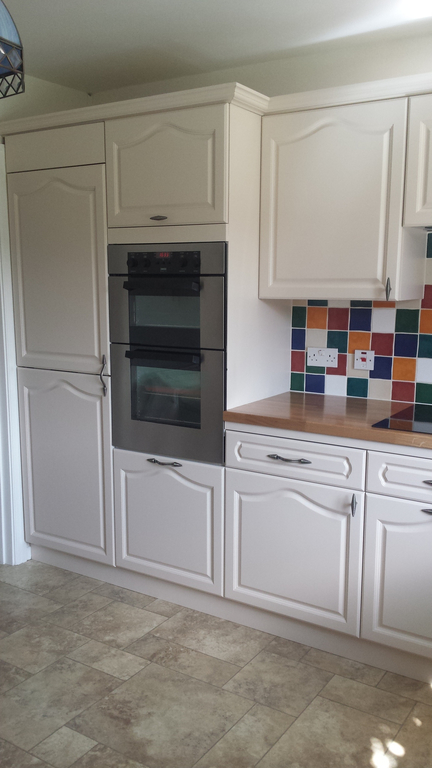 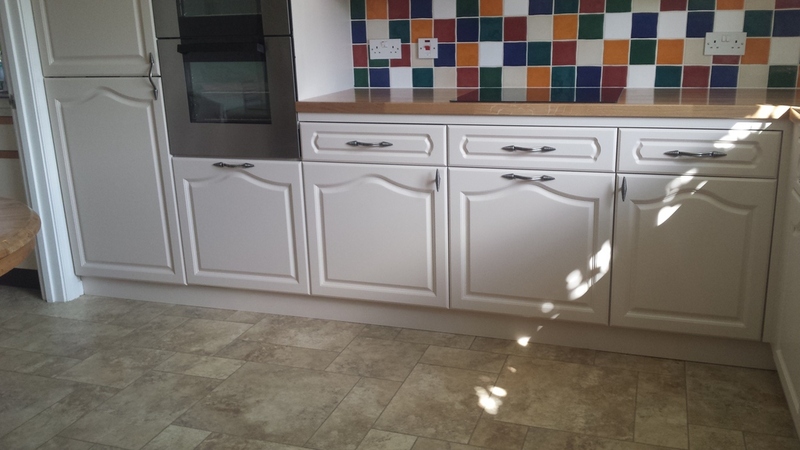 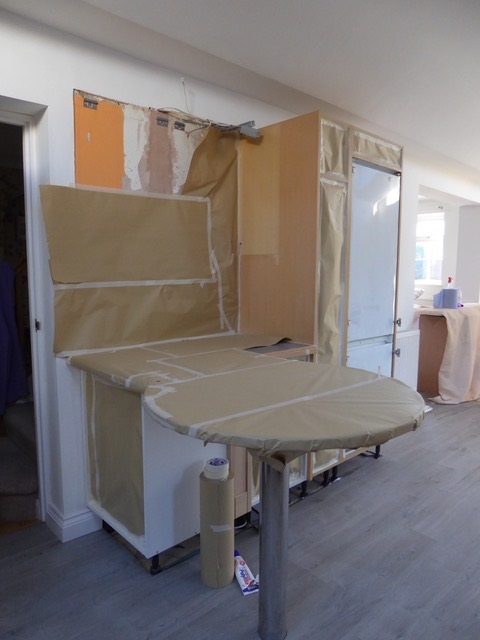 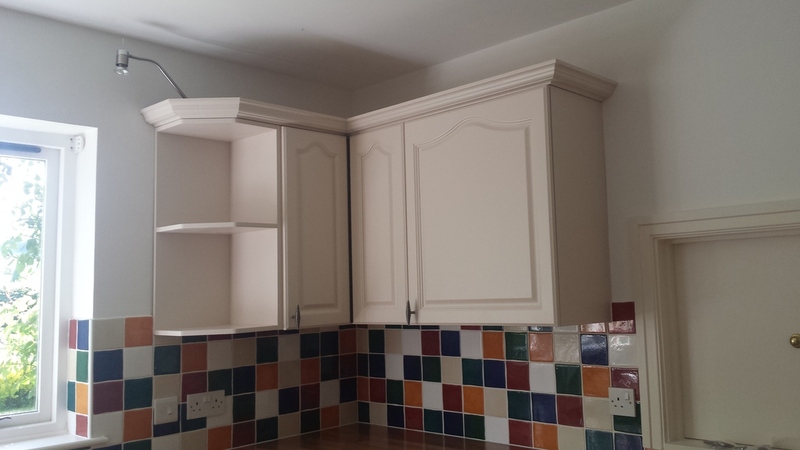 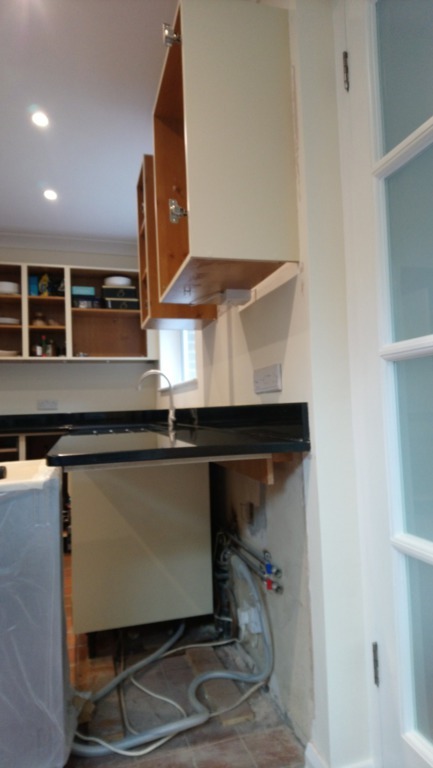 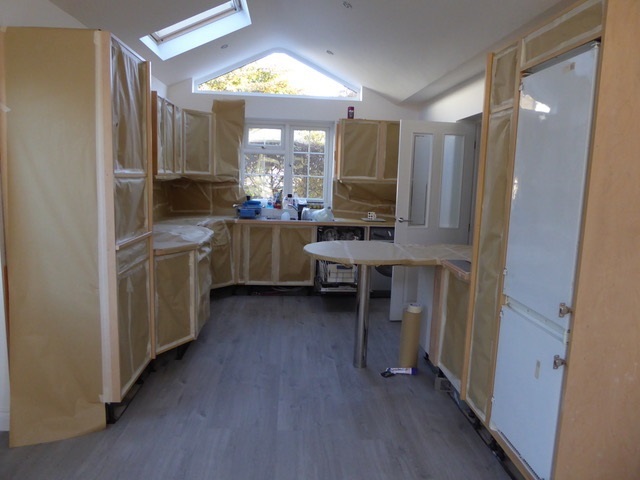 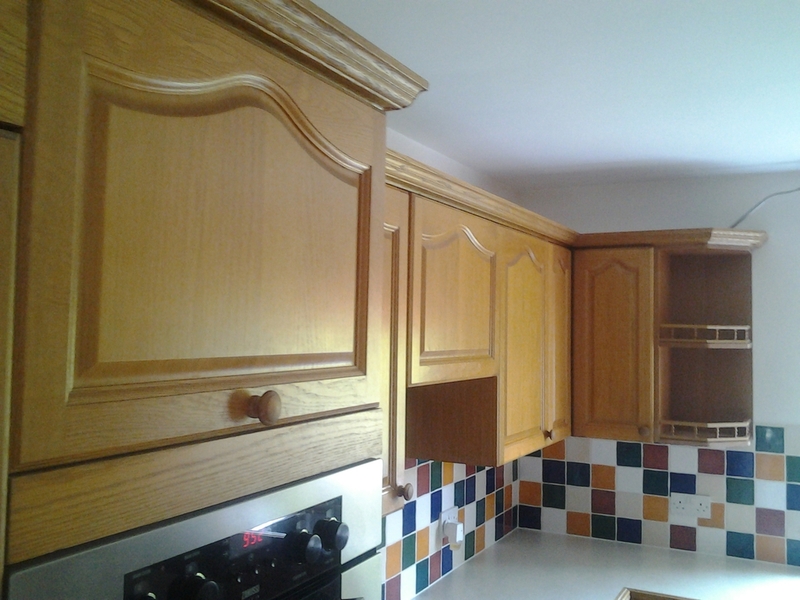 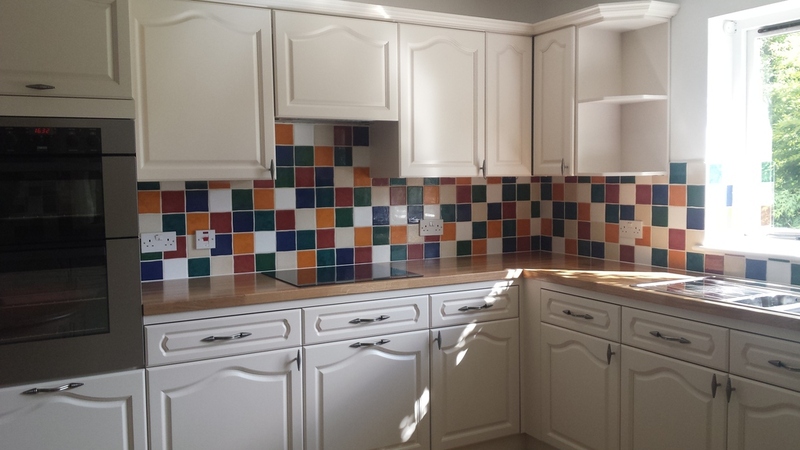 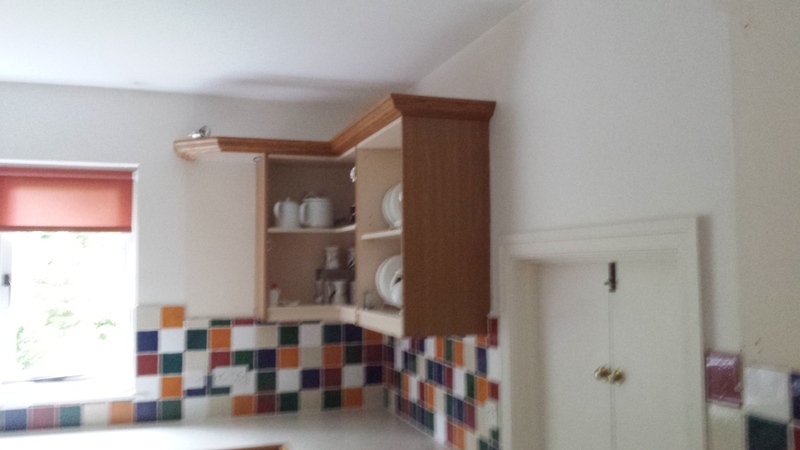 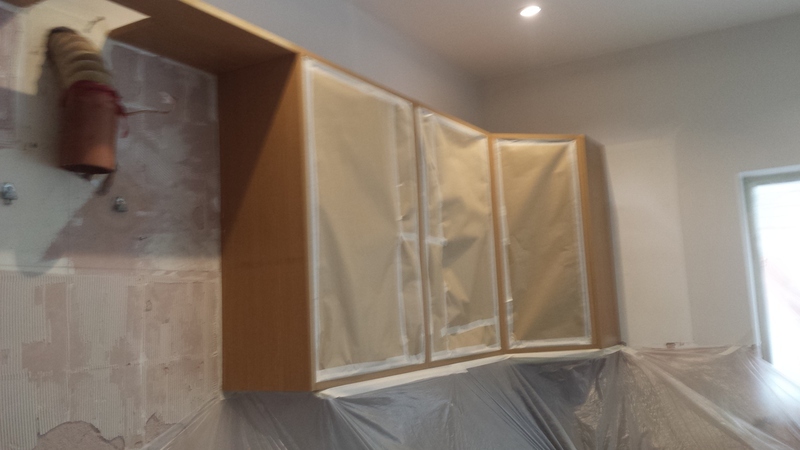 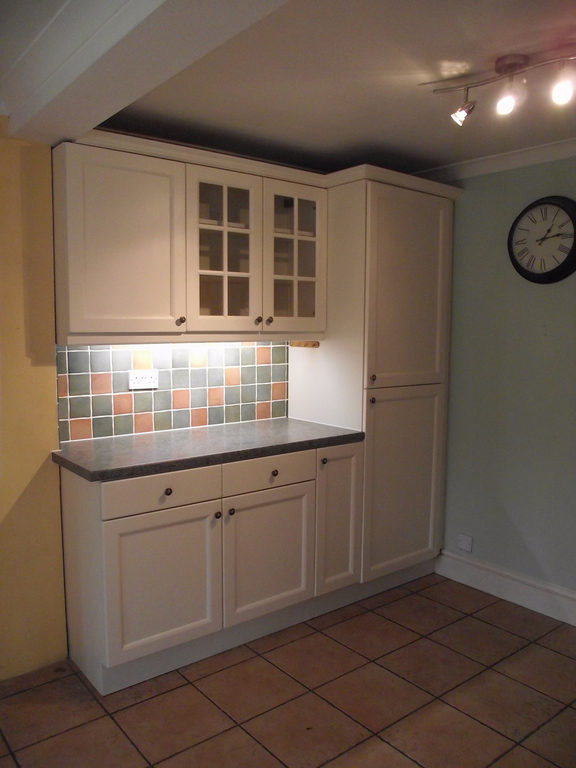 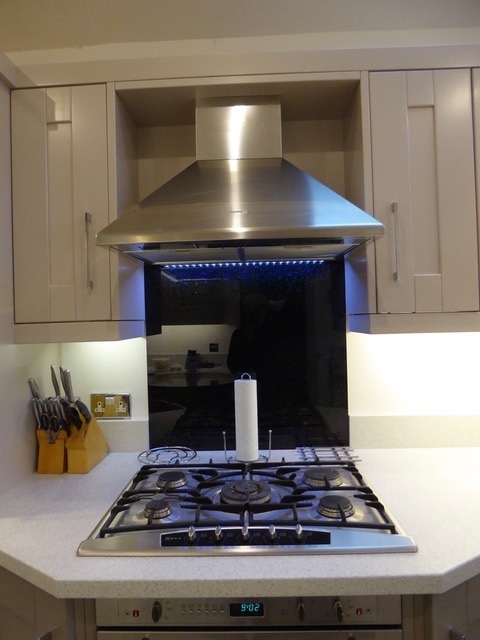 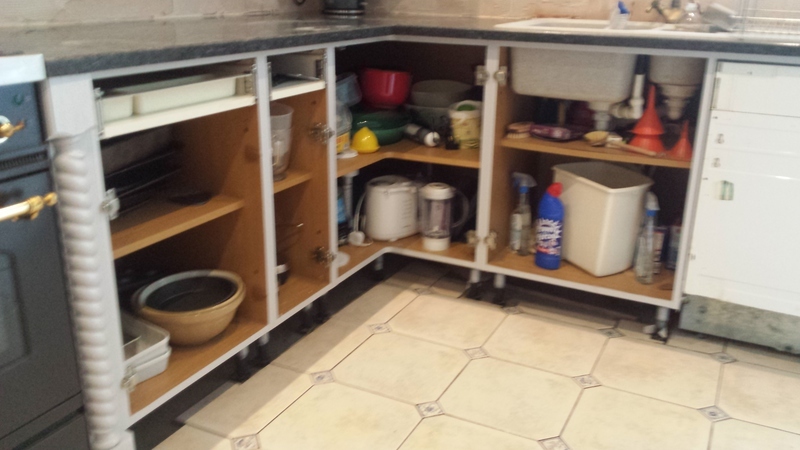 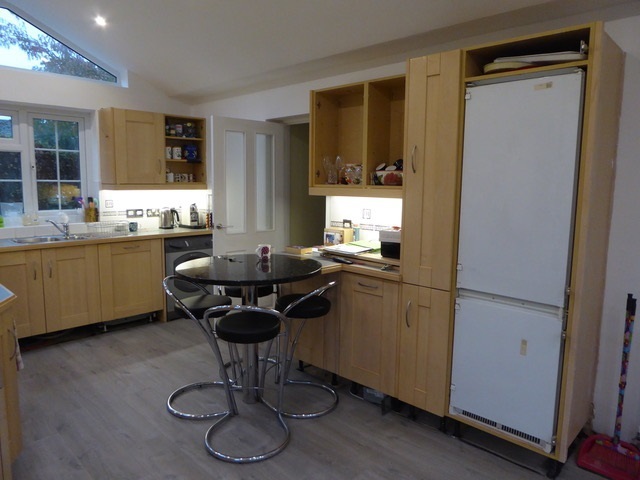 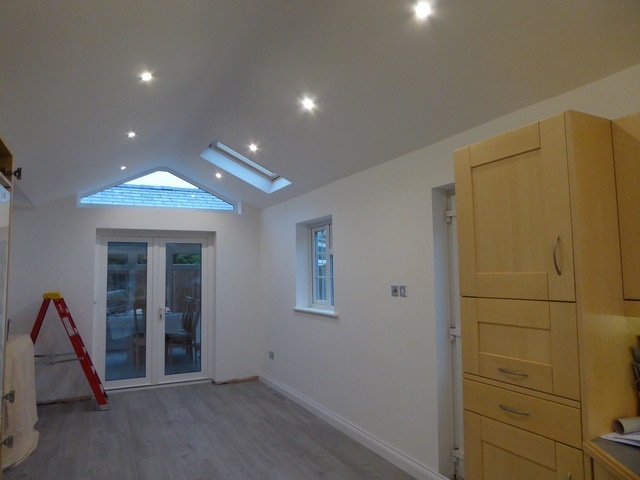 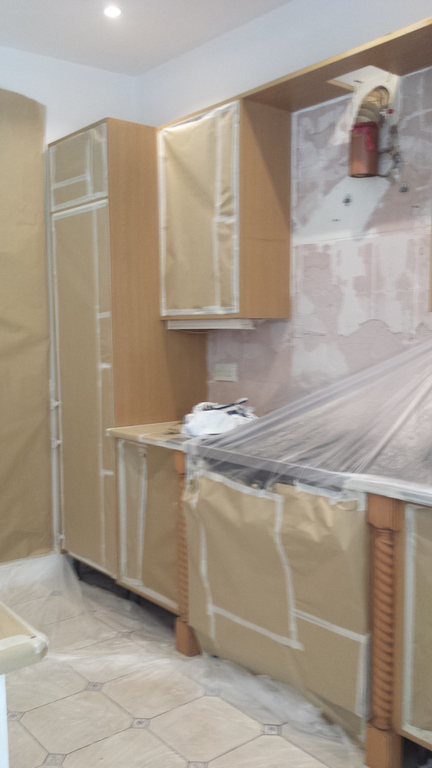 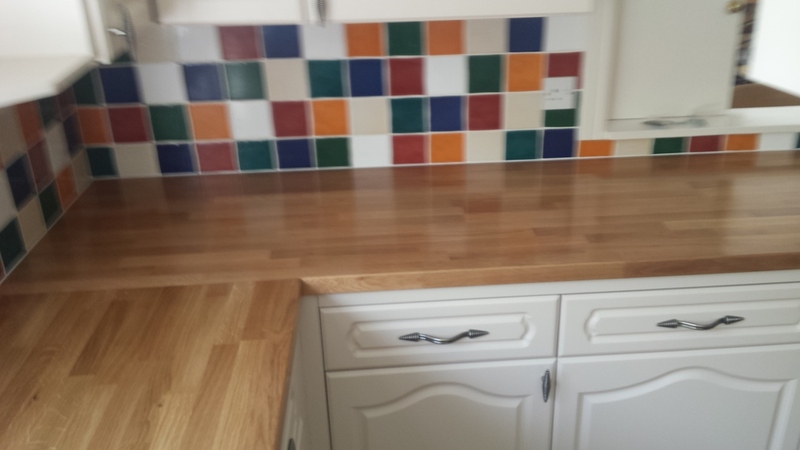 The slideshow below,shows a kitchen we recently transformed in Barnham. 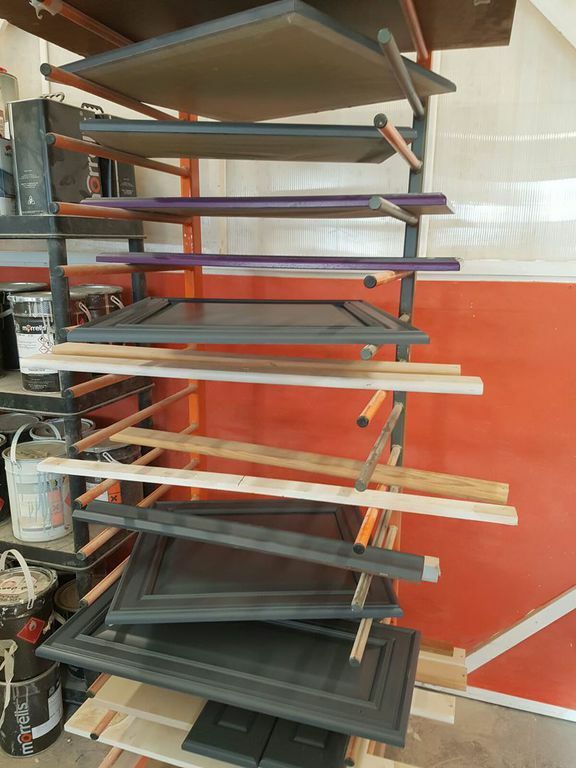 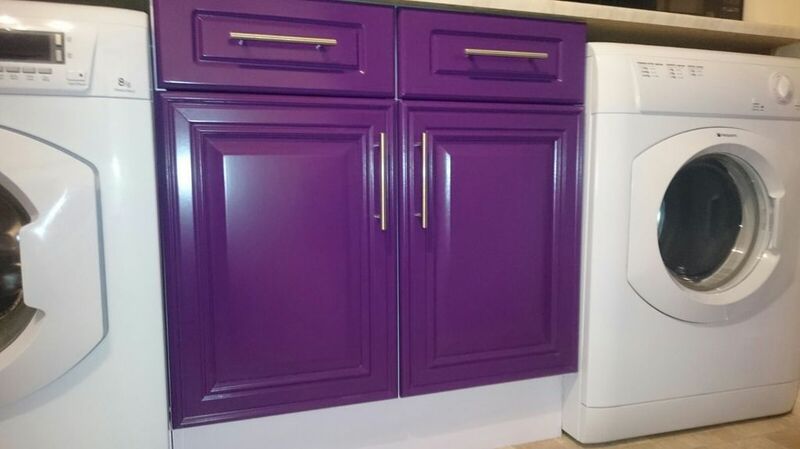 Initially the kitchen was going to be spray painted into one colour, but after looking through some colour options, two colours were chosen. 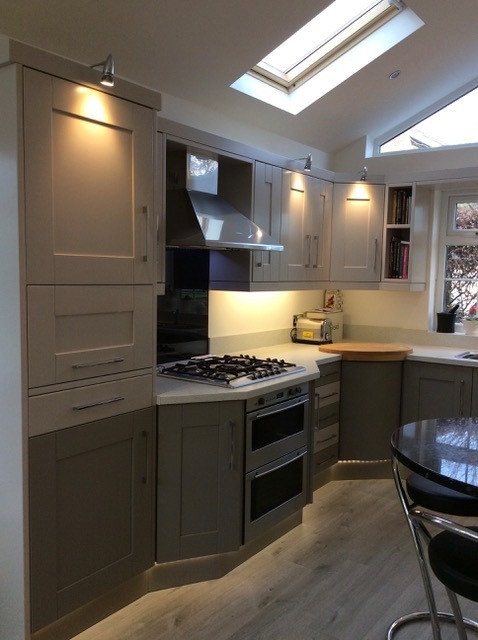 Our paint was colour-matched to Farrow & Ball's Elephant's Breath for the wall units, and colour-matched to Farrow & Ball's Charleston Gray for the base units. 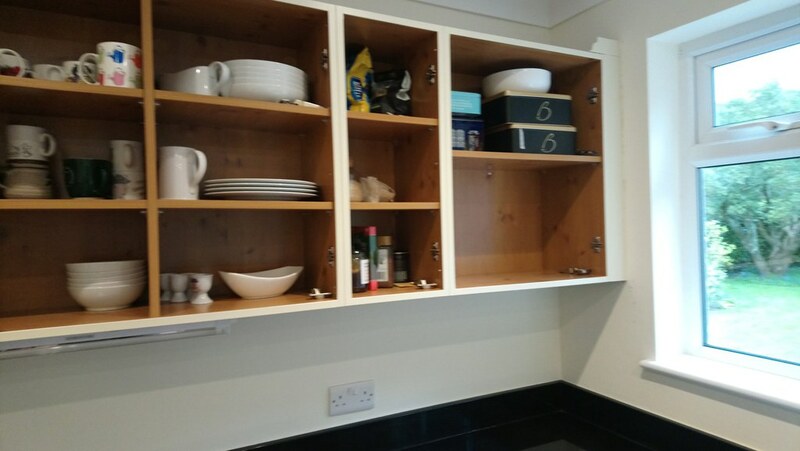 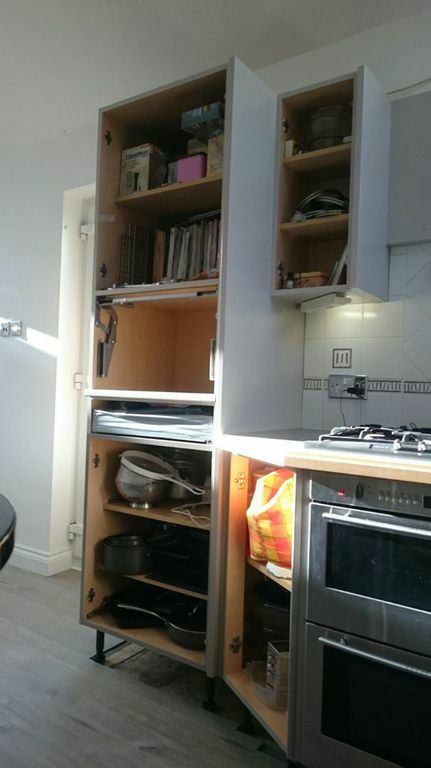 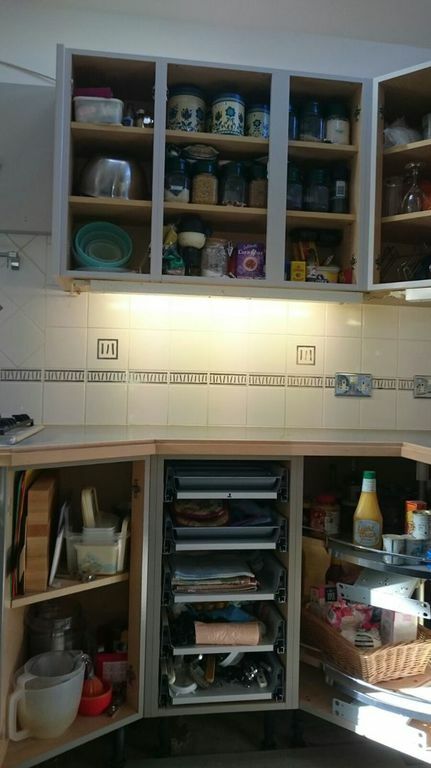 Our customers chose to have the drawers in alternate colours, which enhances the uniqueness further. 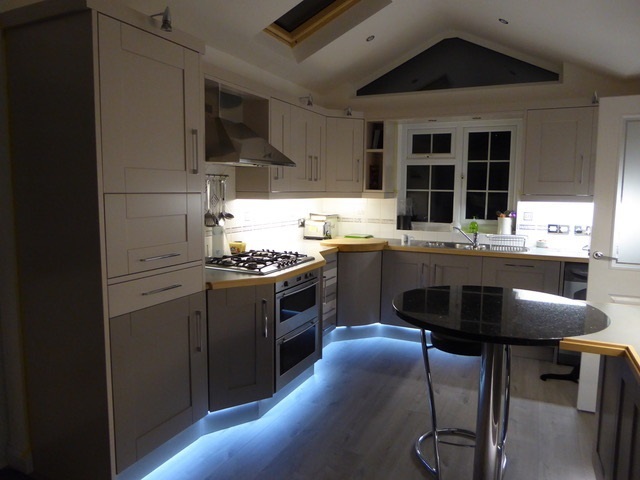 They chose to change their handles and also, independently, changed the worktops and had lighting installed. 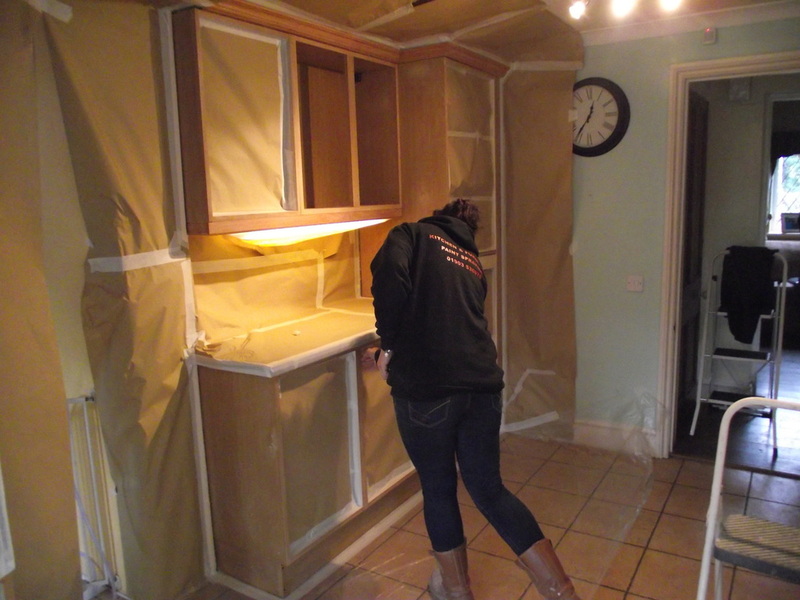 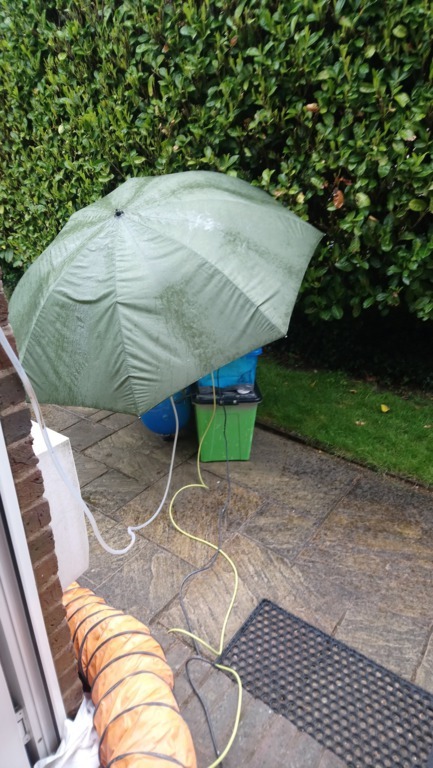 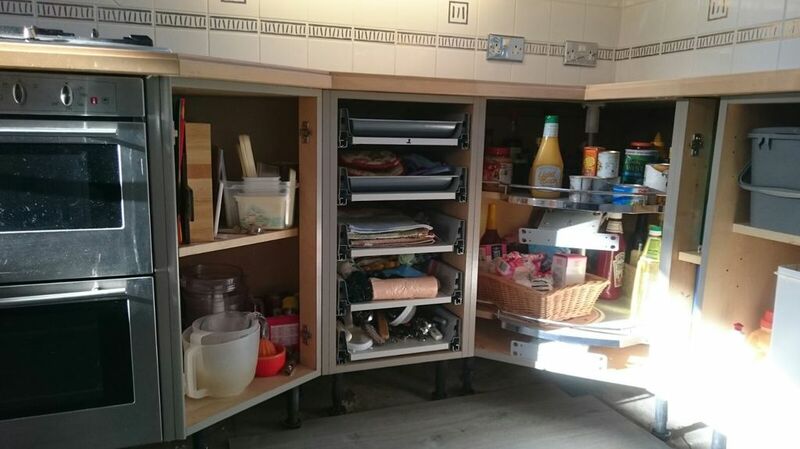 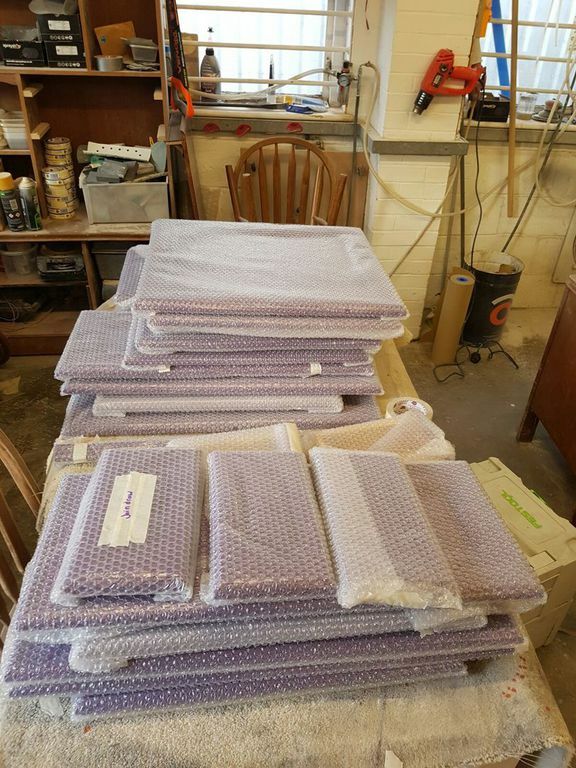 Our customers have kindly emailed us lots of after photos to complete the story. 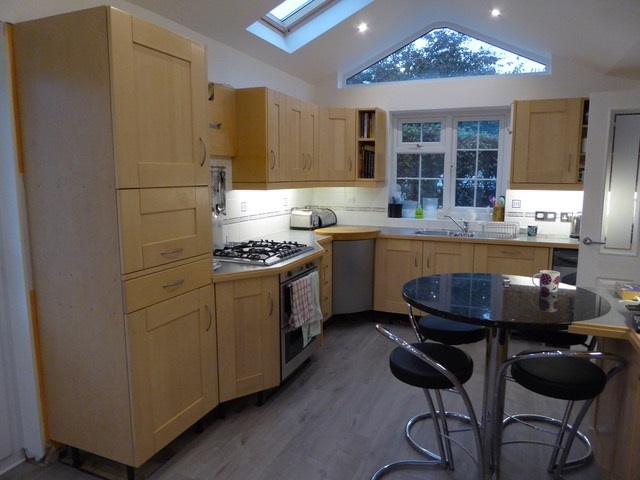 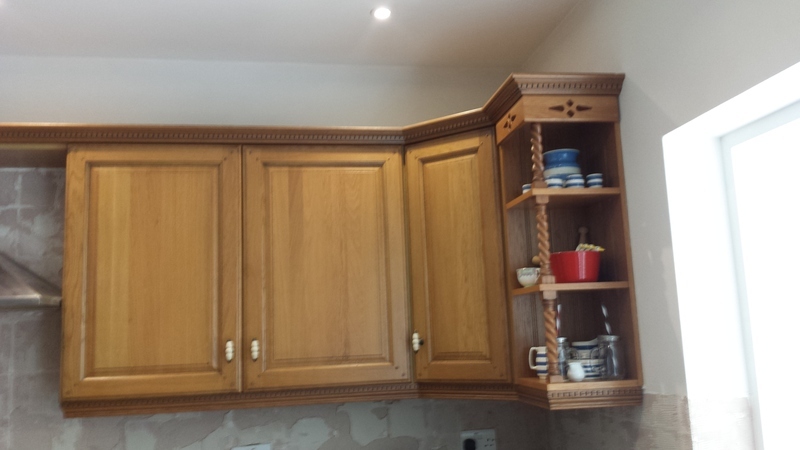 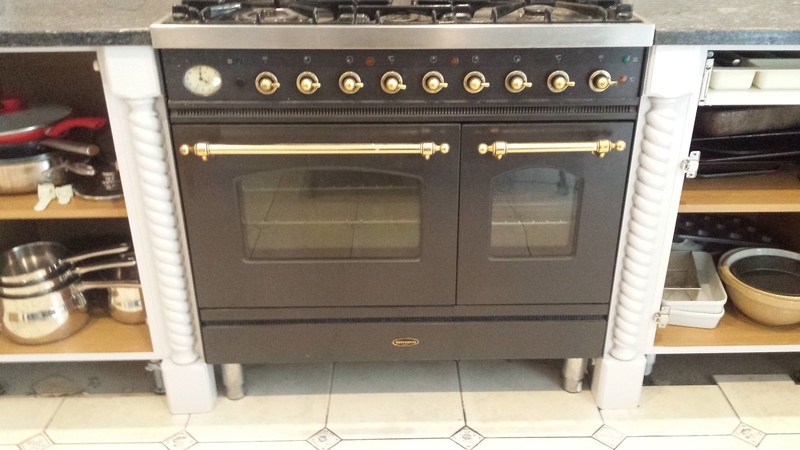 The transformation in this kitchen is amazing and our customers are thrilled with the result! 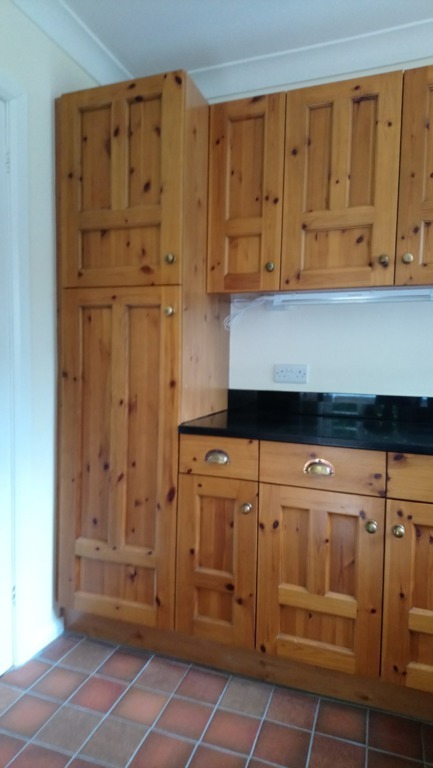 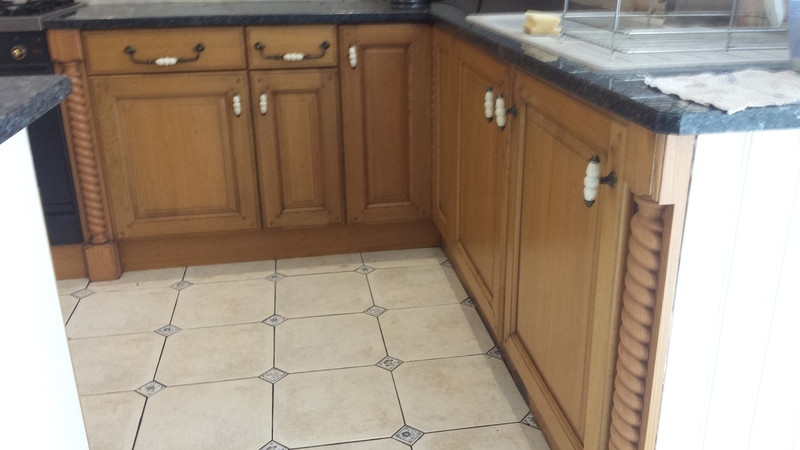 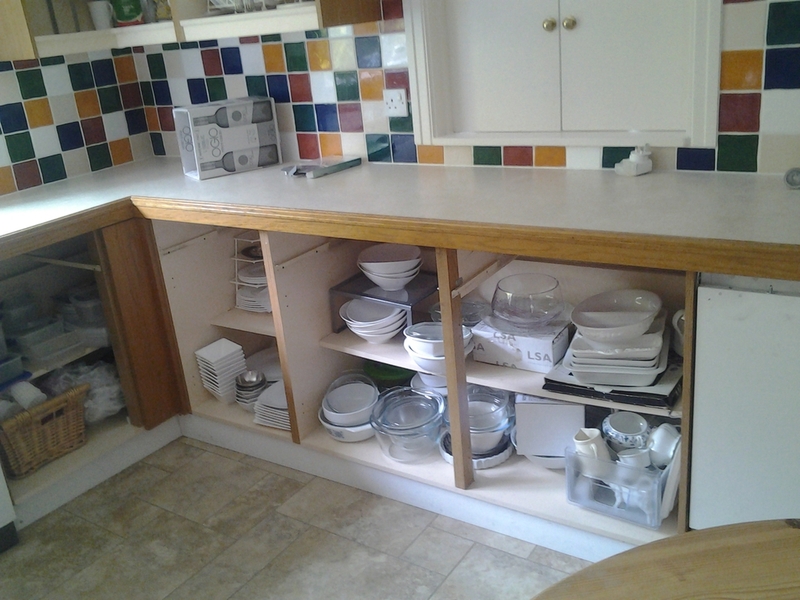 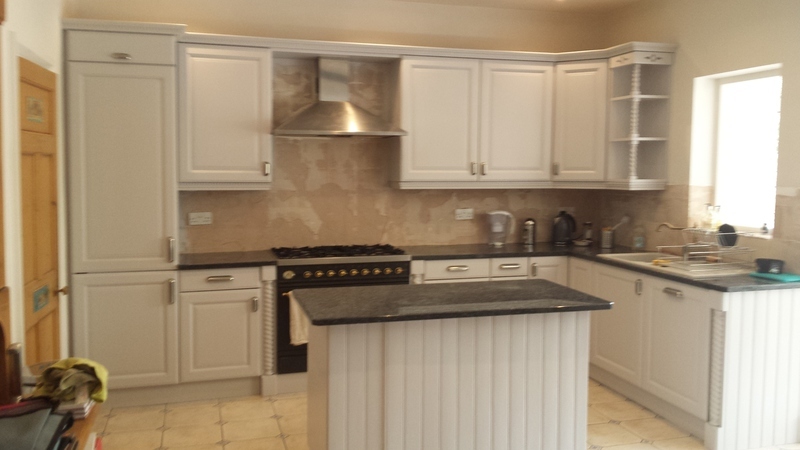 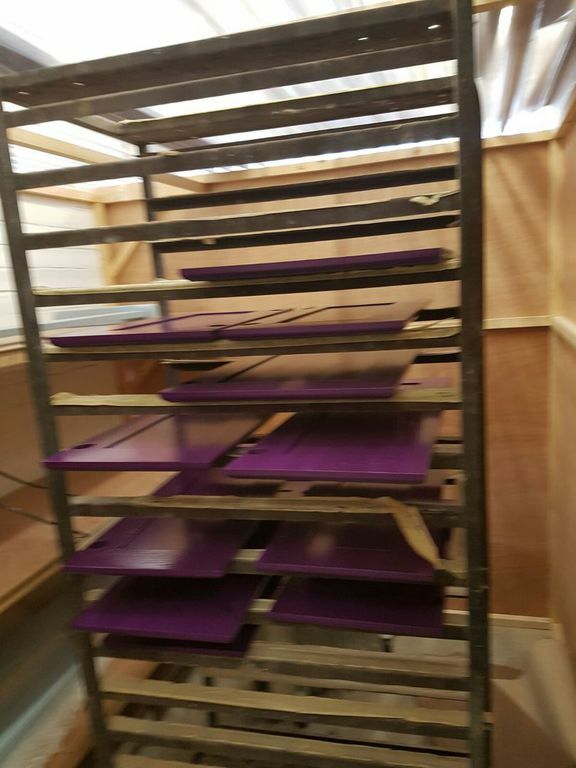 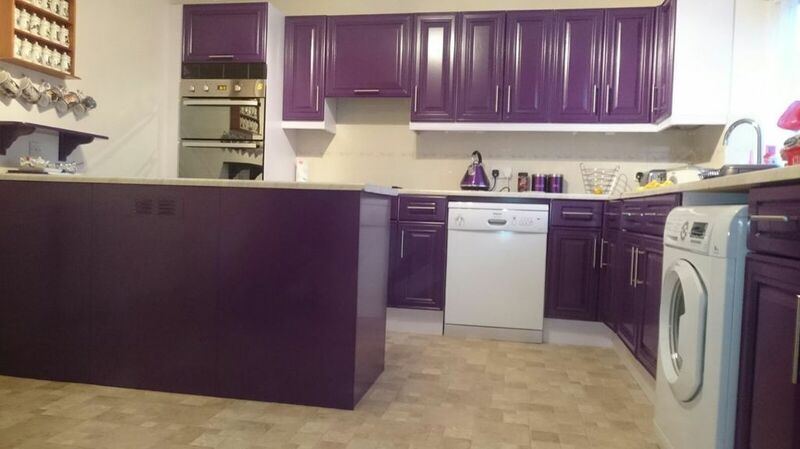 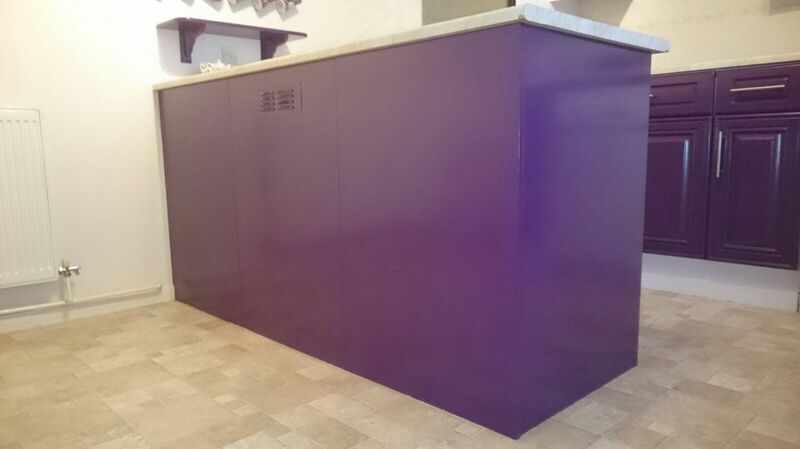 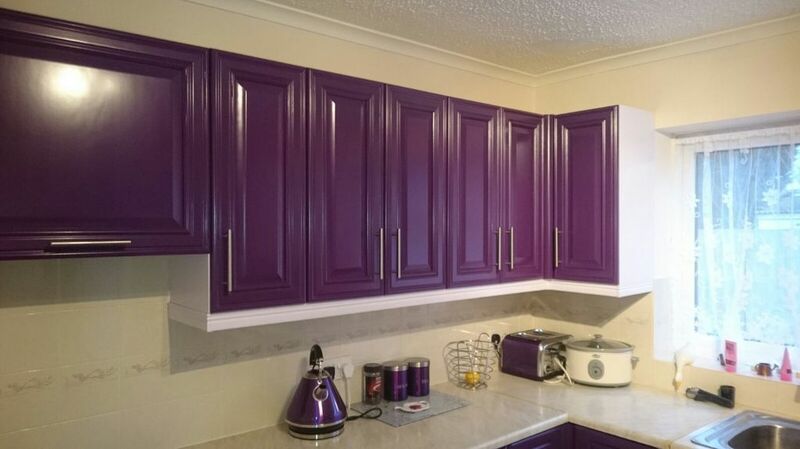 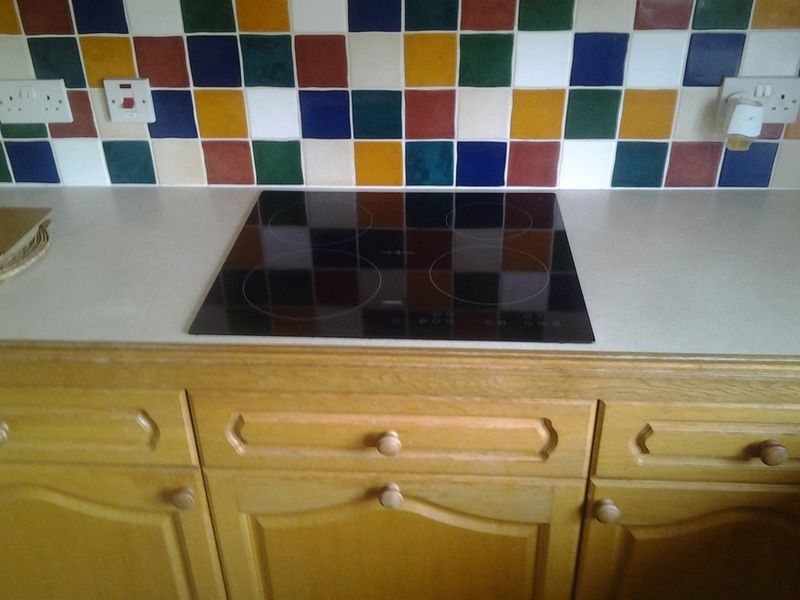 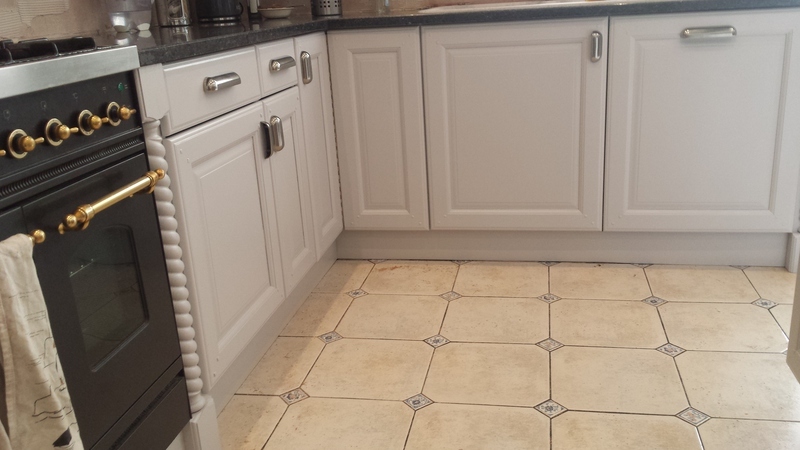 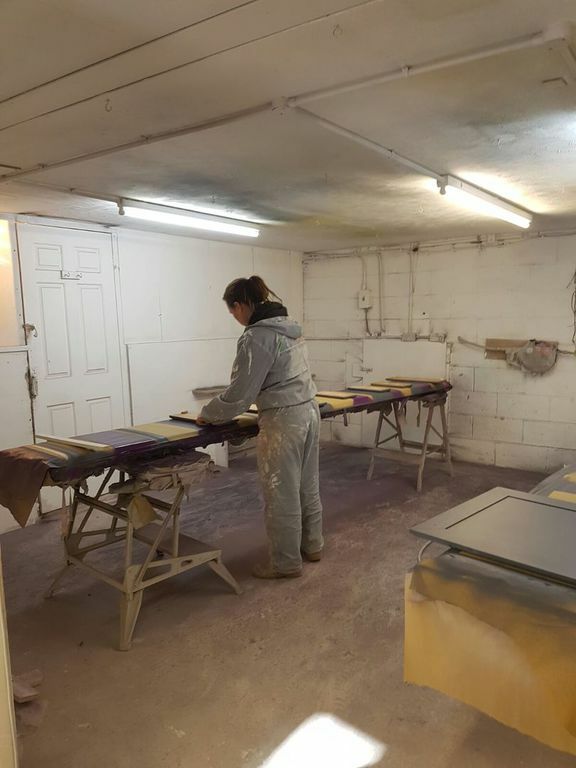 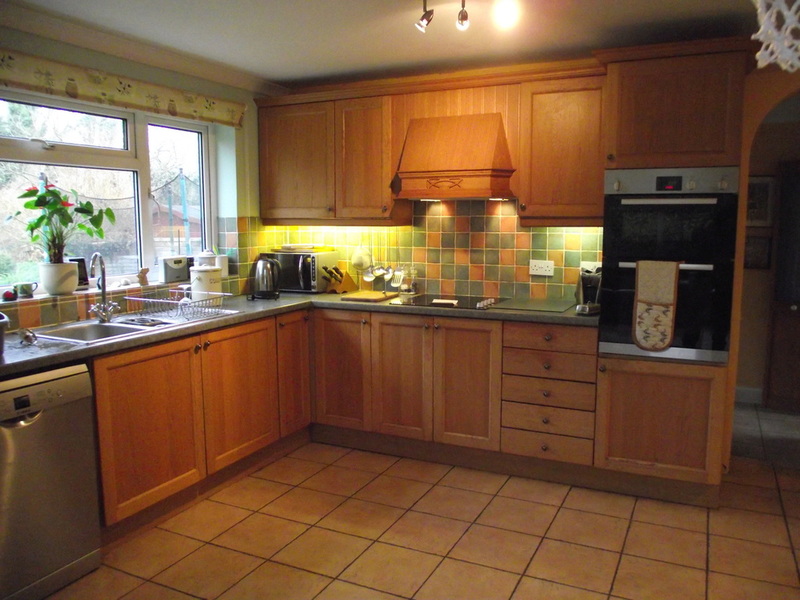 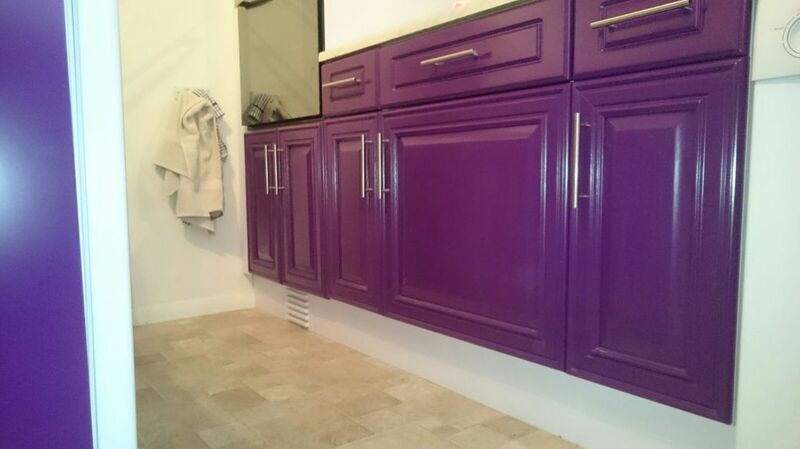 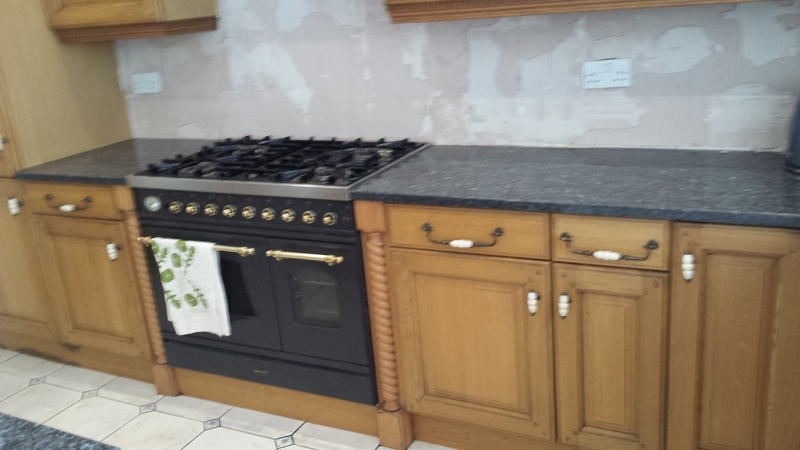 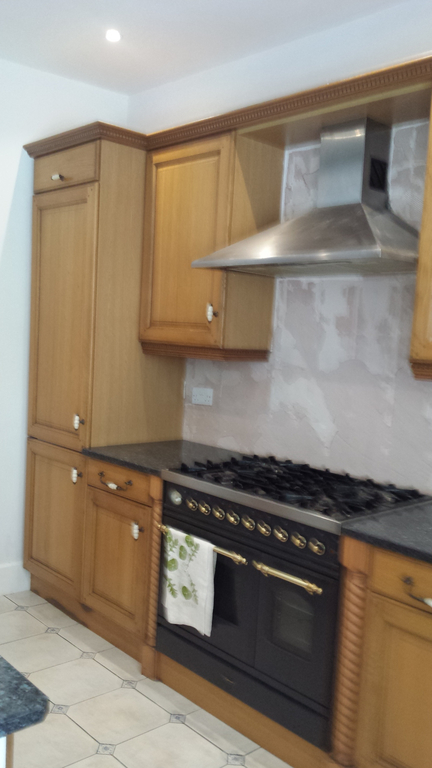 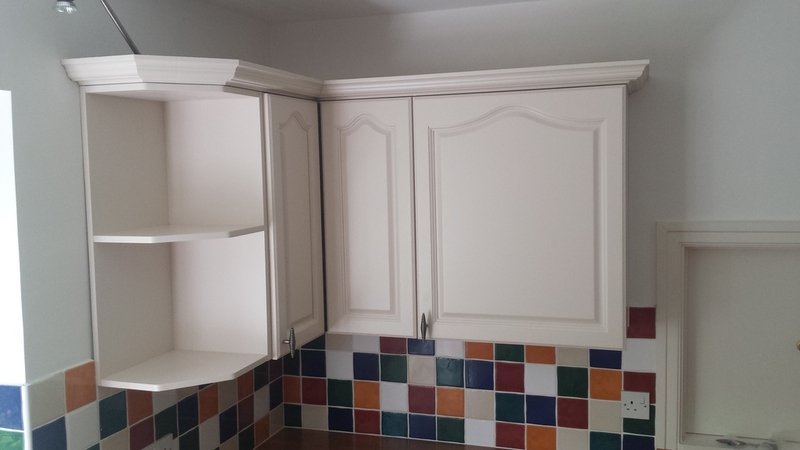 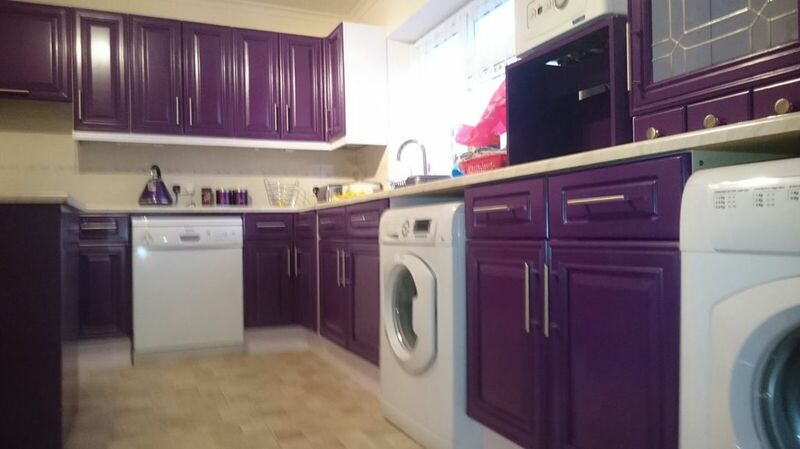 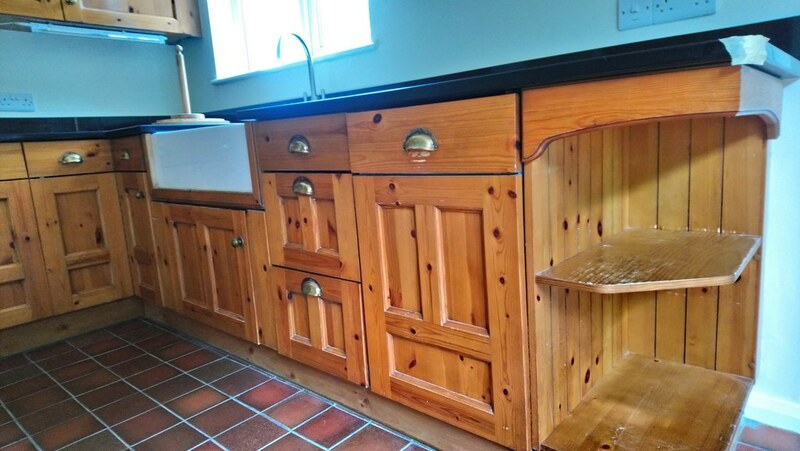 We spray painted and transformed this customer's kitchen into her favourite colour... purple. 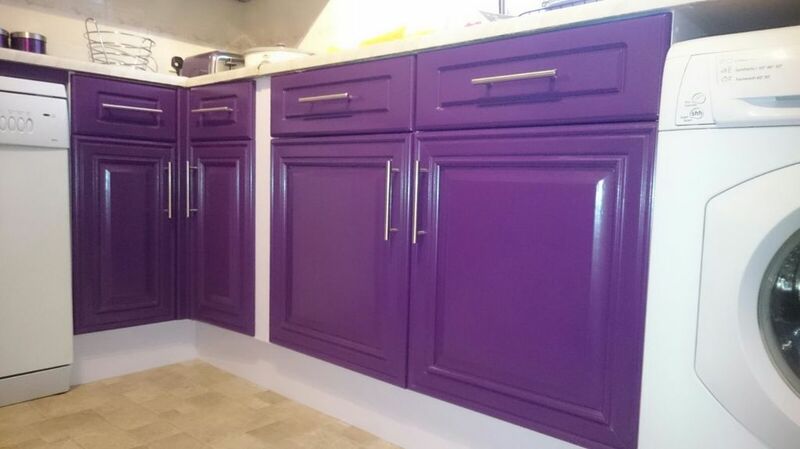 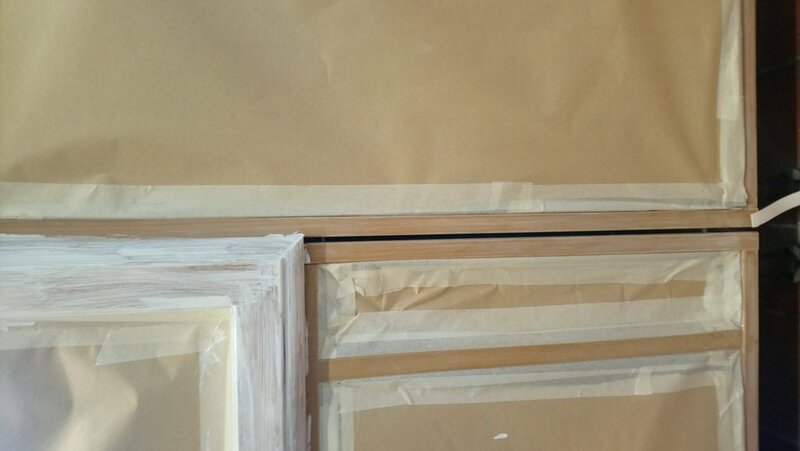 The doors, drawers and centre island were spray painted into paint colour-matched to Dulux "Velvet Ribbon1". 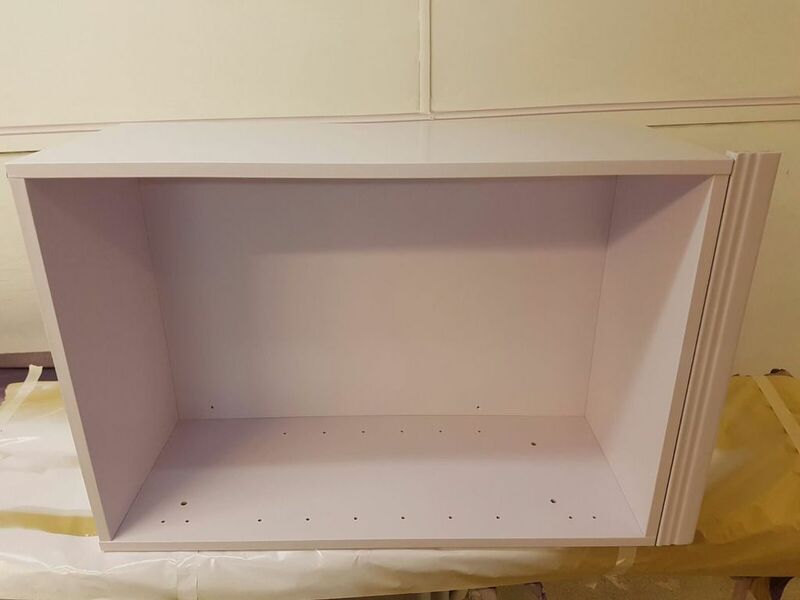 The end panels, pelmet and the inside of the display cabinet spray painted & colour-matched to Dulux "Violet White". 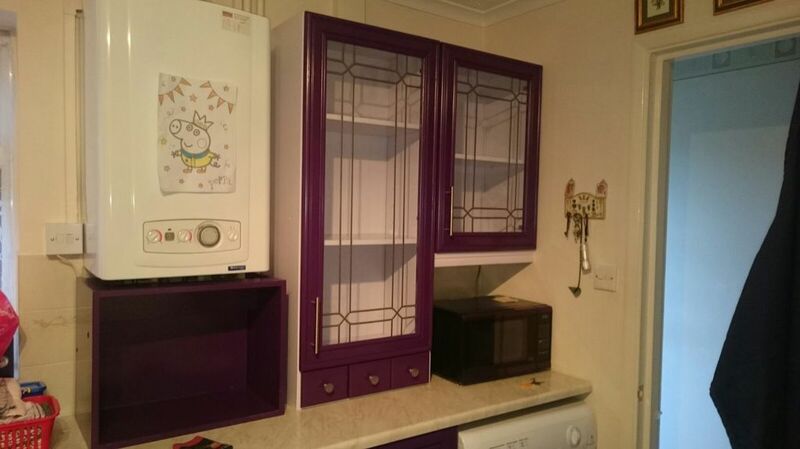 The dining table & chairs and shelves are also spray painted to match. 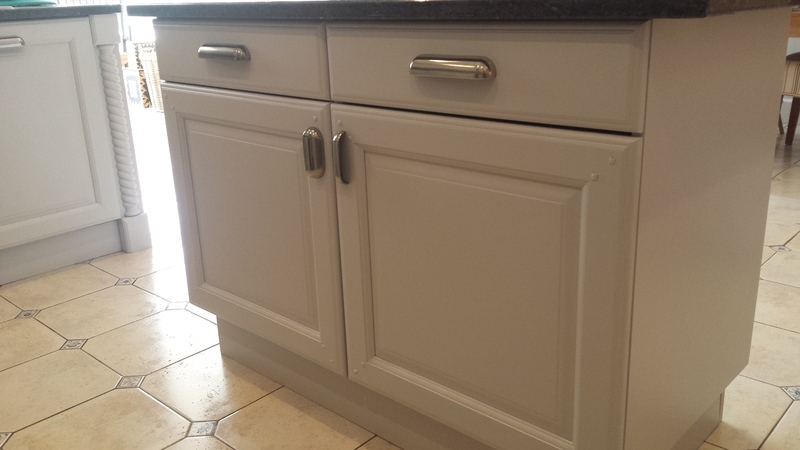 The handles were changed to fresh new bar handles using the existing handles holes. 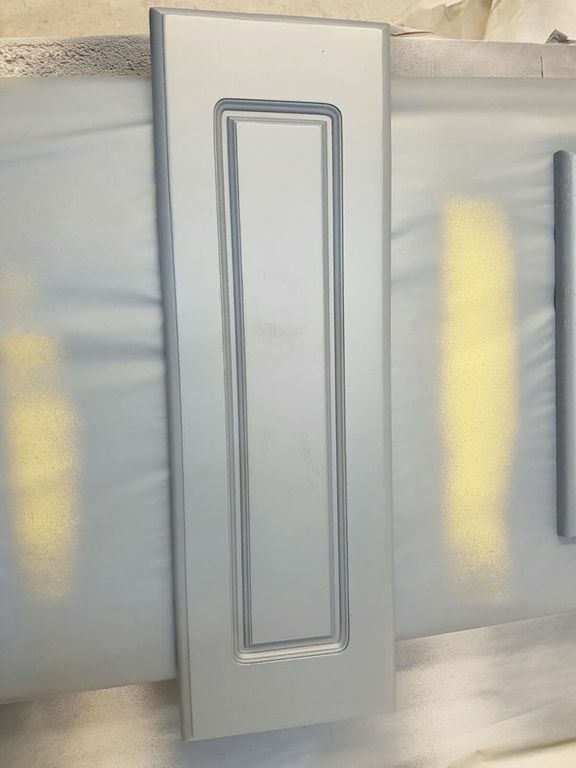 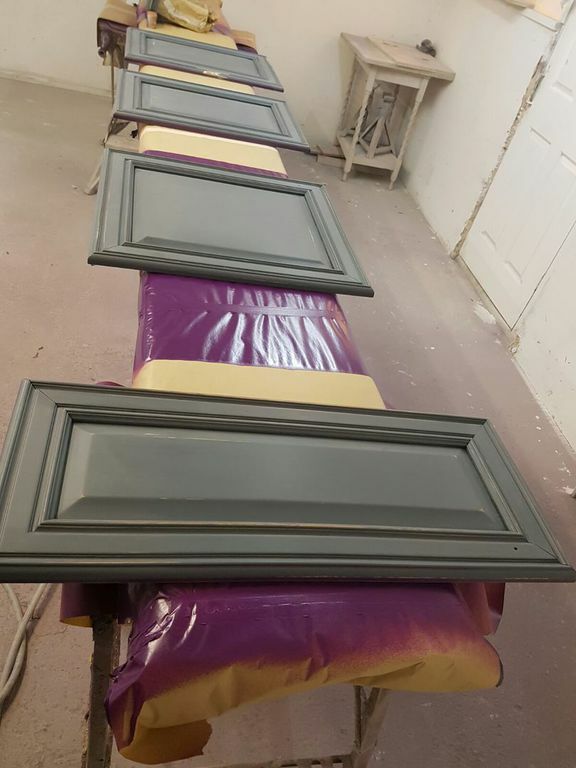 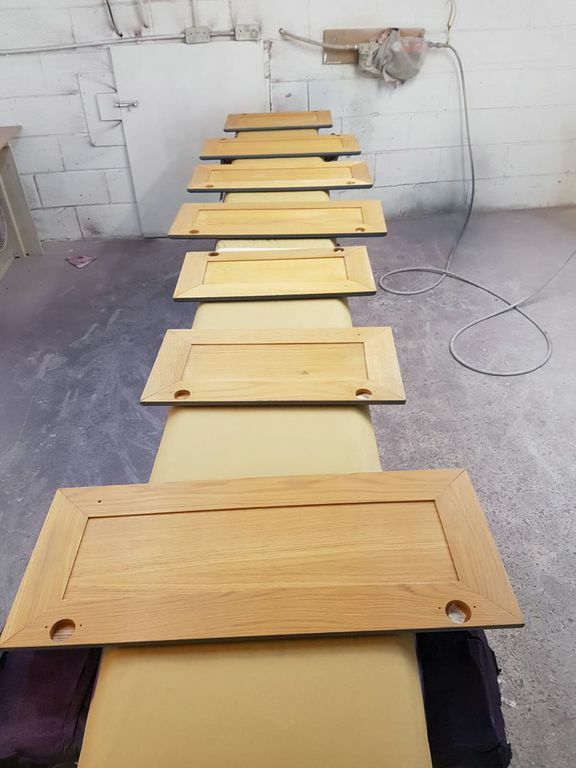 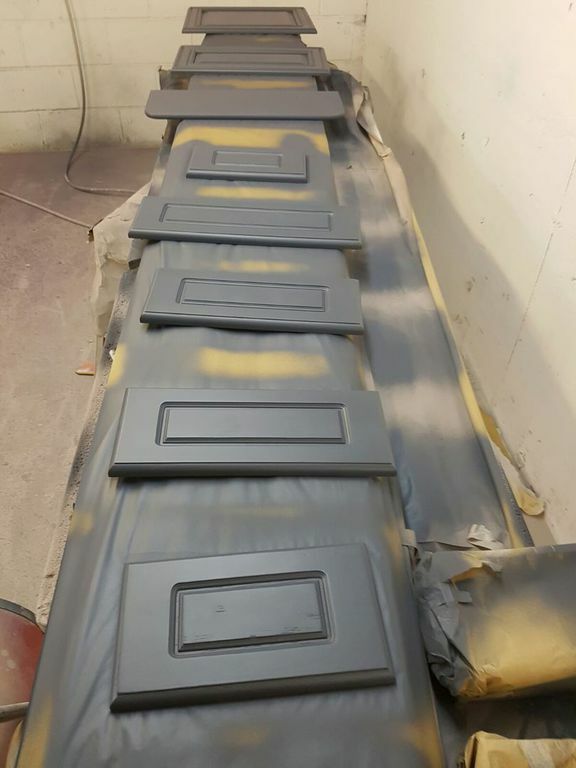 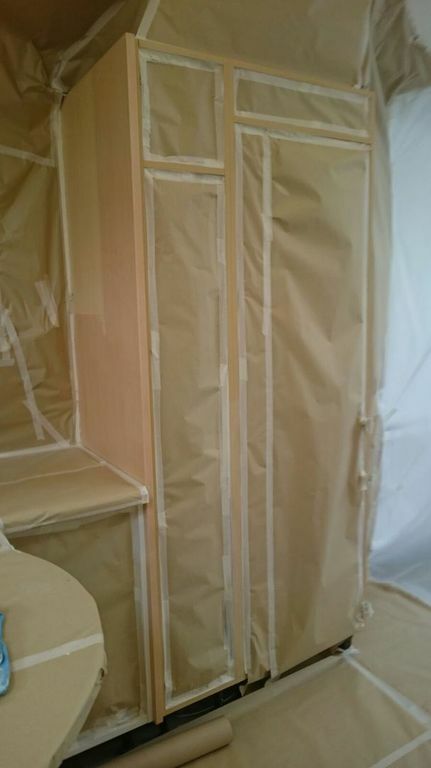 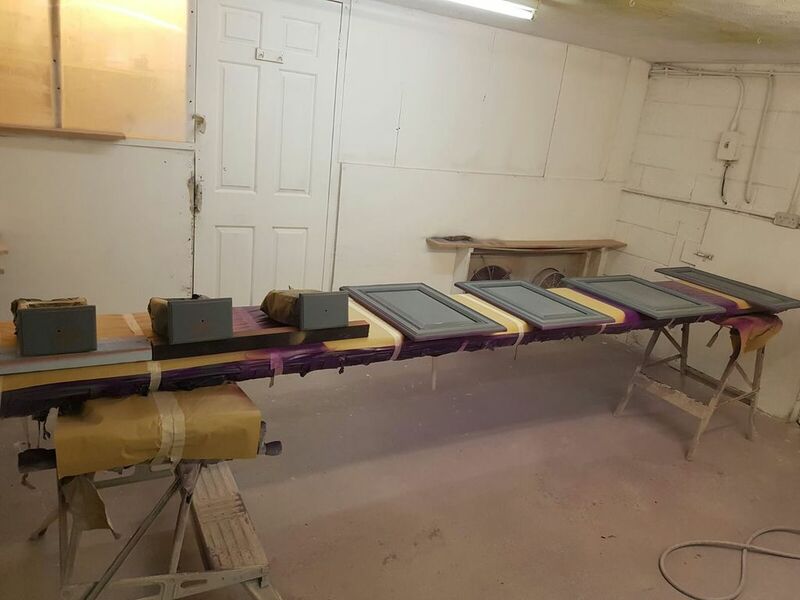 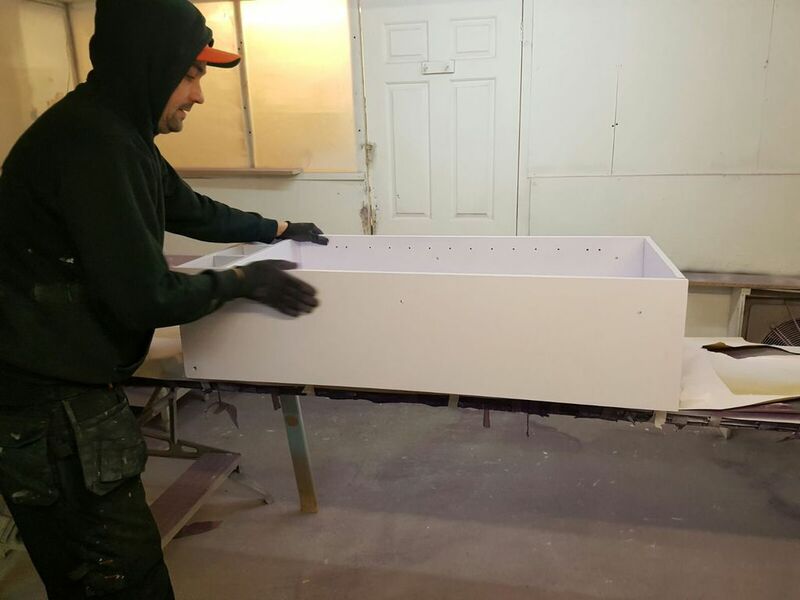 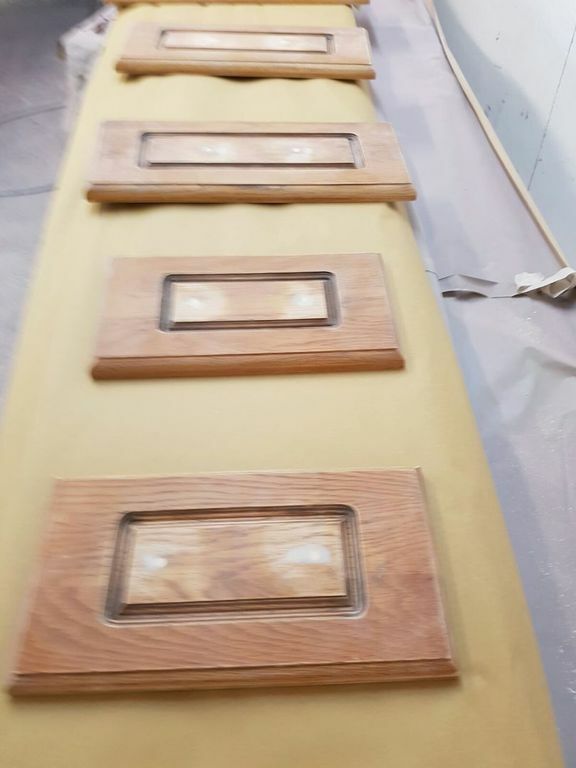 You can see the doors being sprayed on our Videos page. 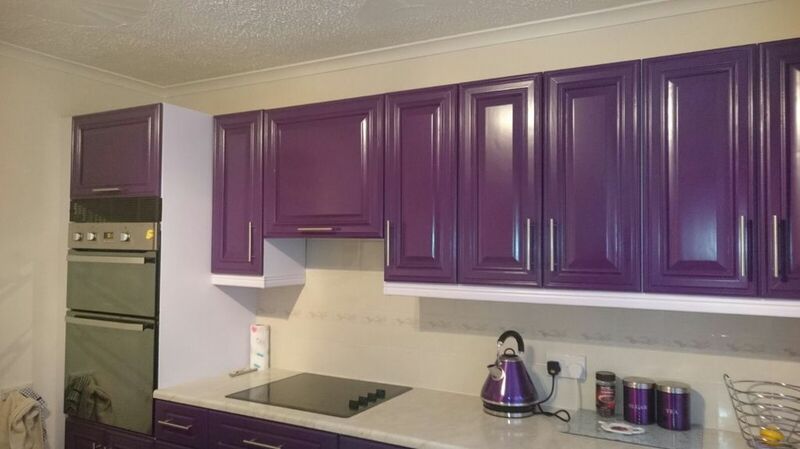 A bold colour choice has resulted in an amazing transformation! 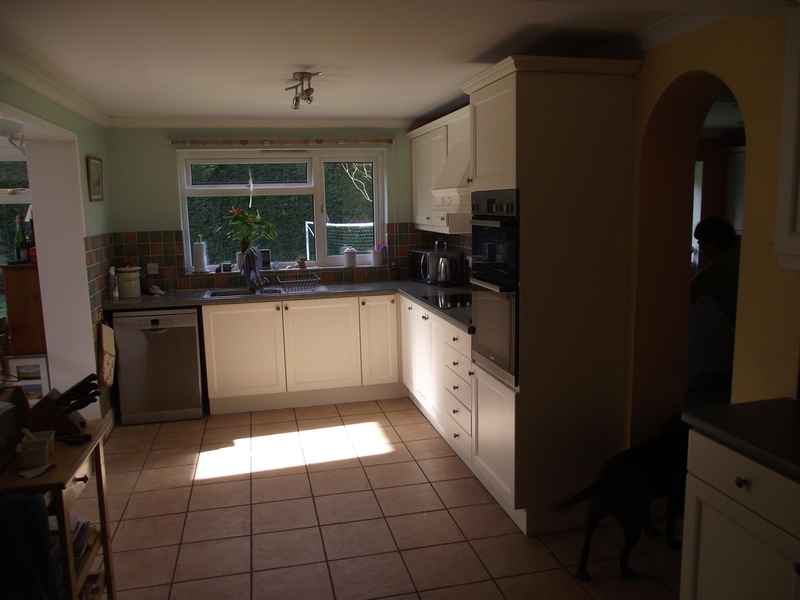 The slideshow below shows a kitchen we transformed in Southwick. 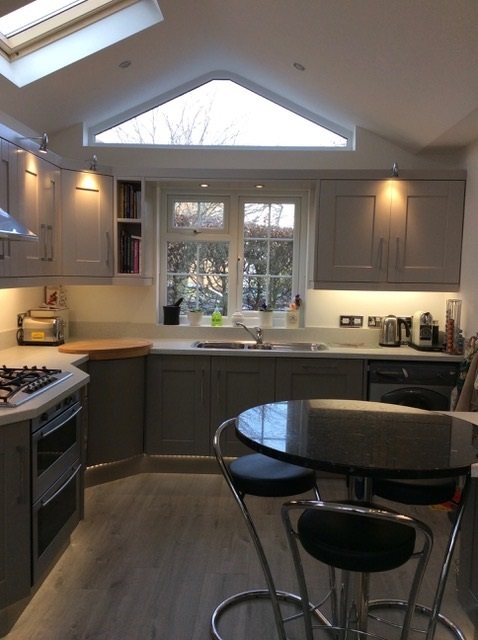 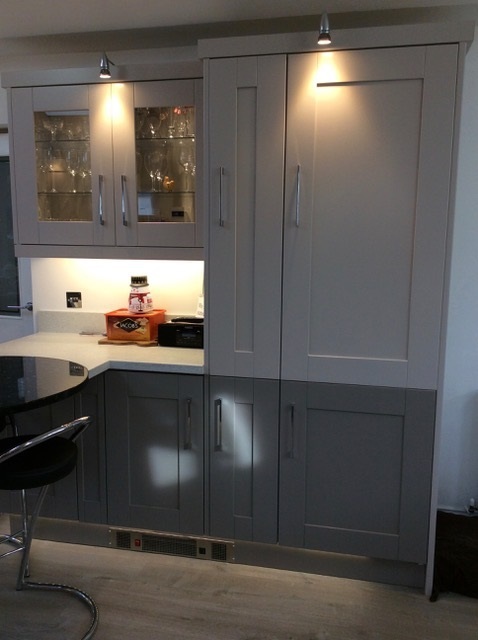 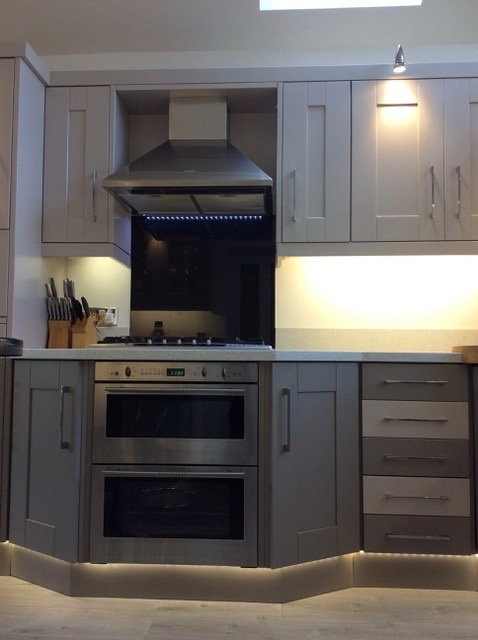 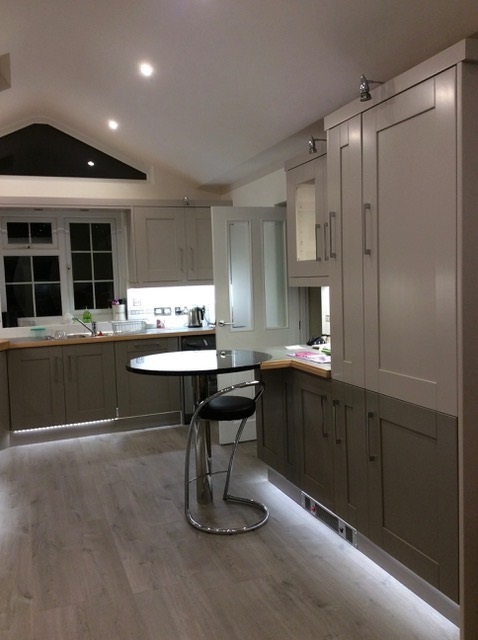 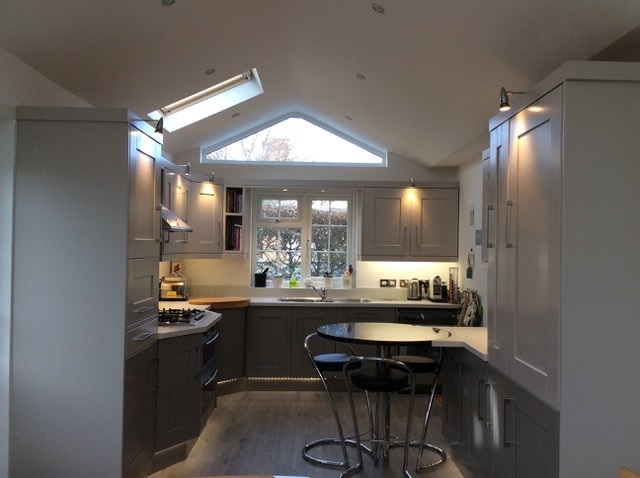 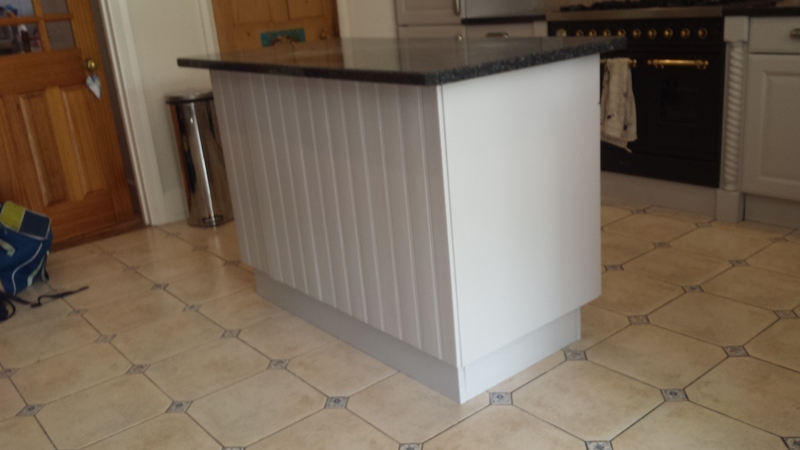 Our clients wanted to update their kitchen from a dark wood to a pale grey. 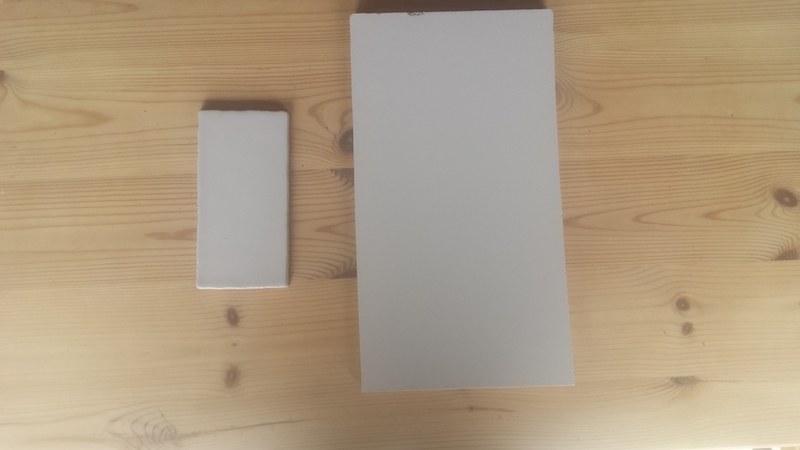 After searching for the perfect colour, they found the exact grey they liked in a wall tile. 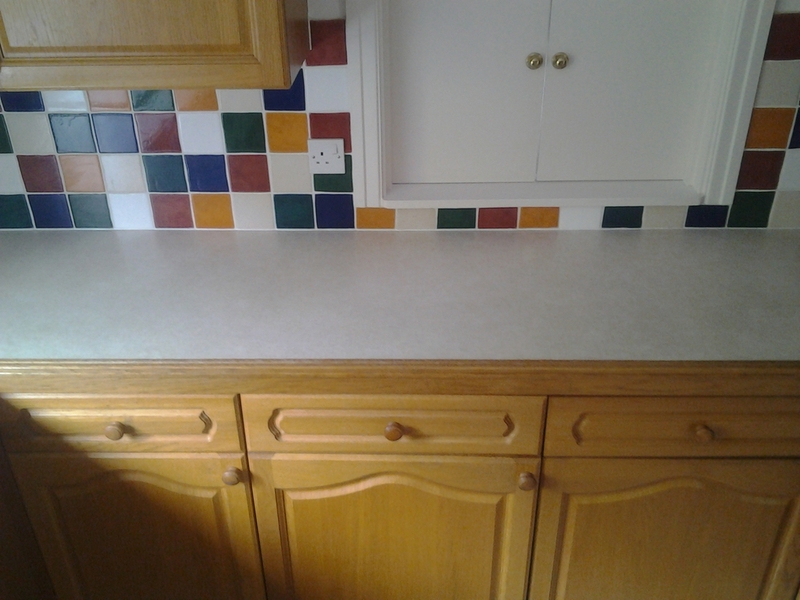 We sent the tile off to be analysed and have the paint colour matched. 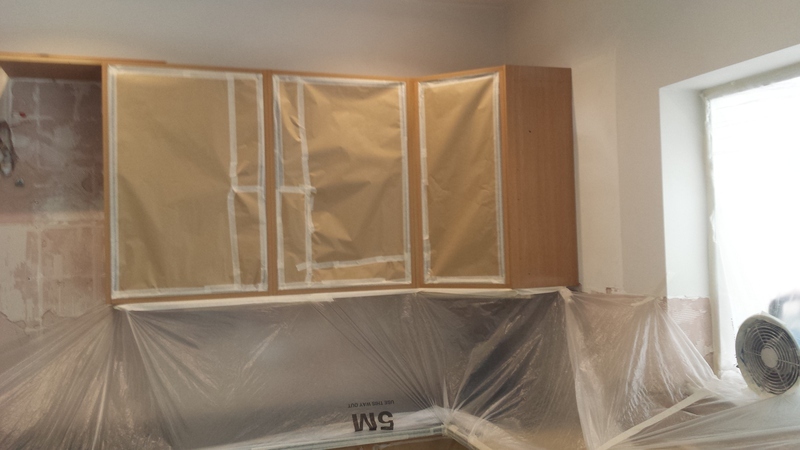 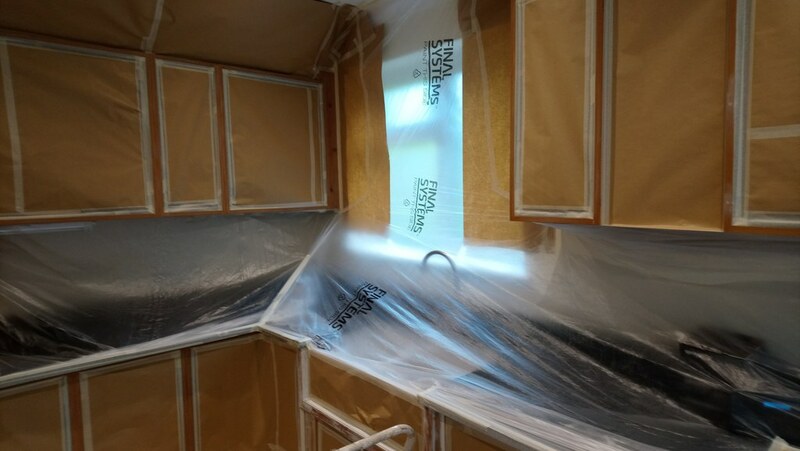 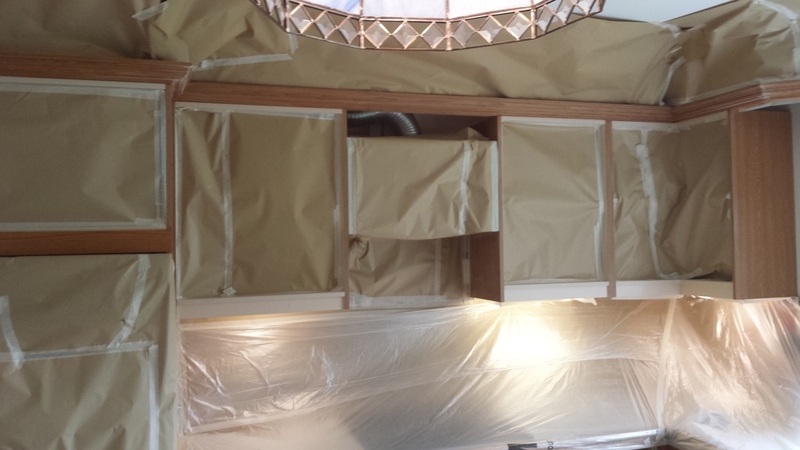 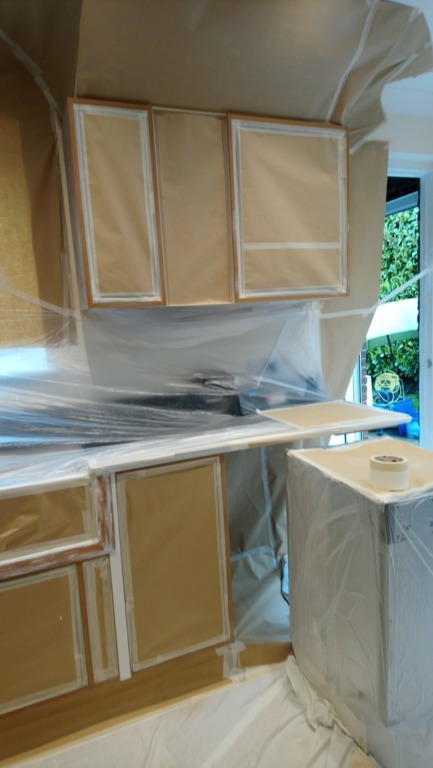 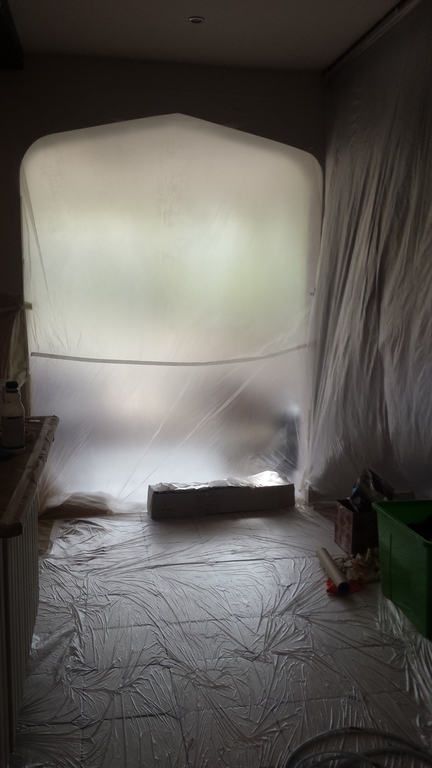 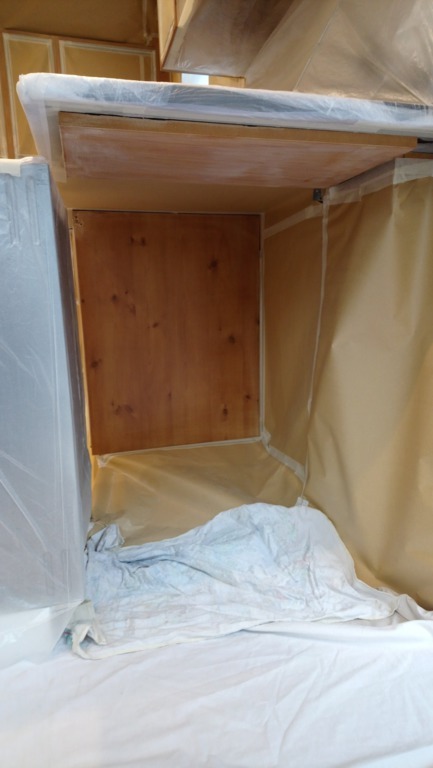 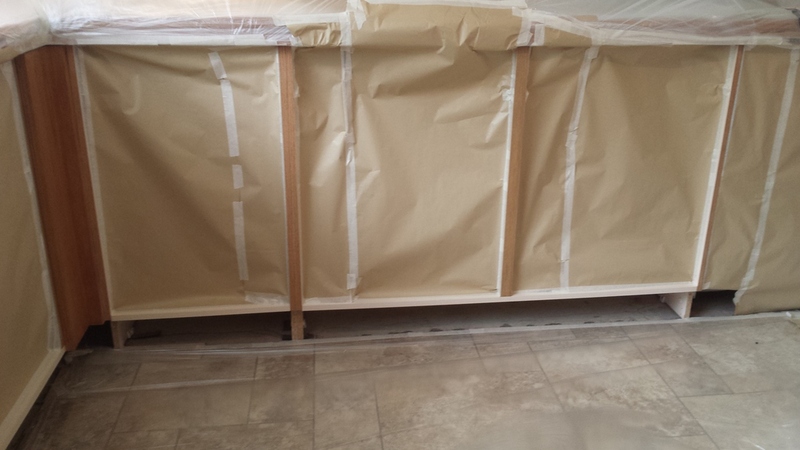 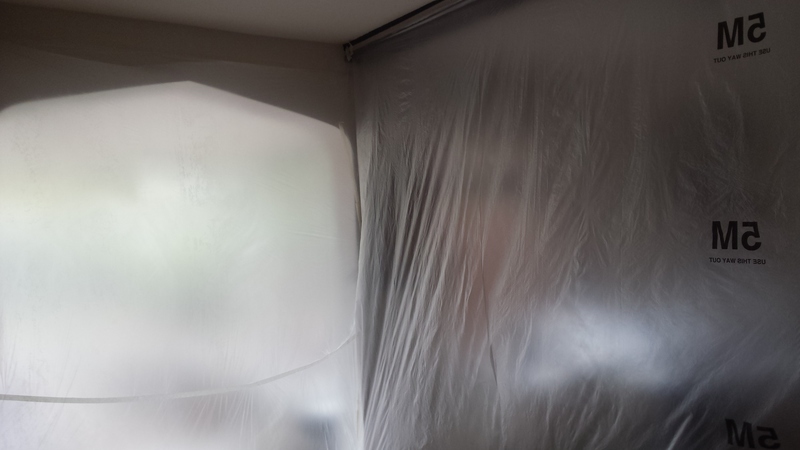 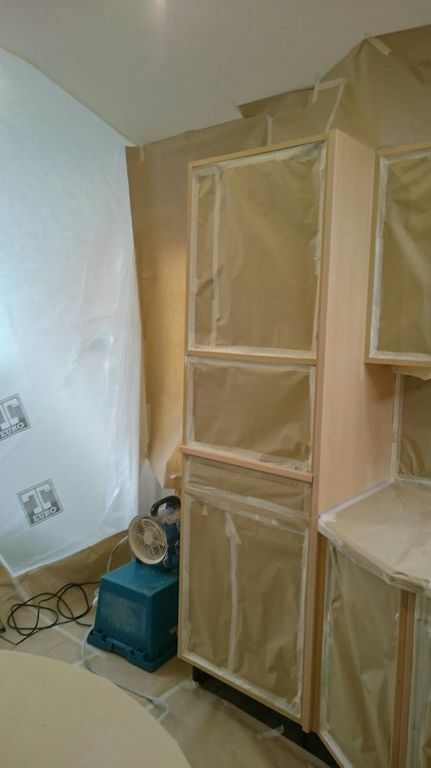 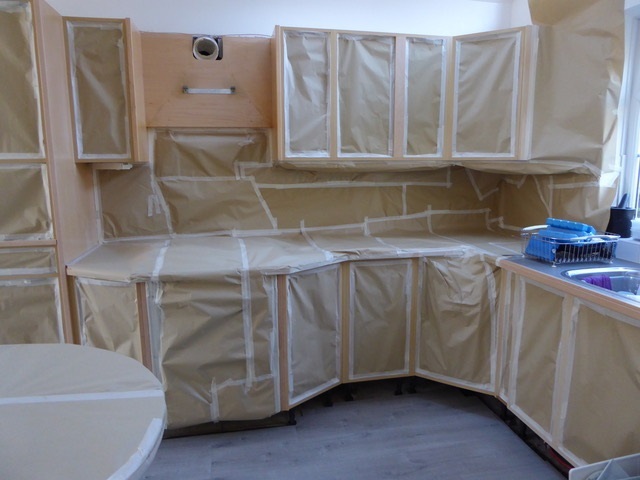 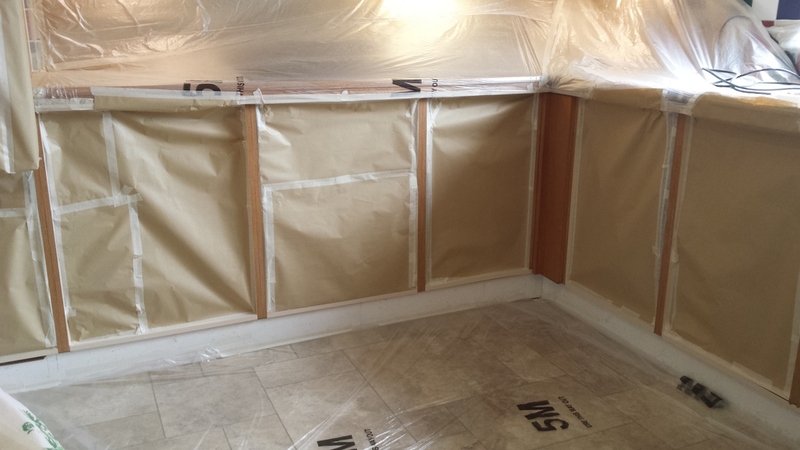 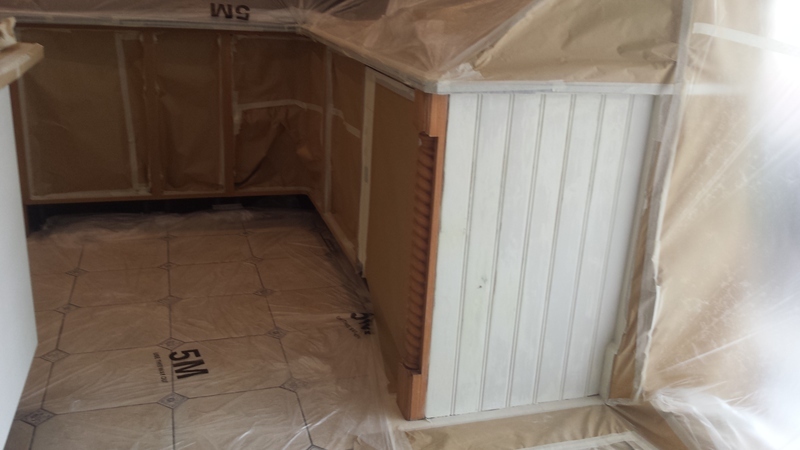 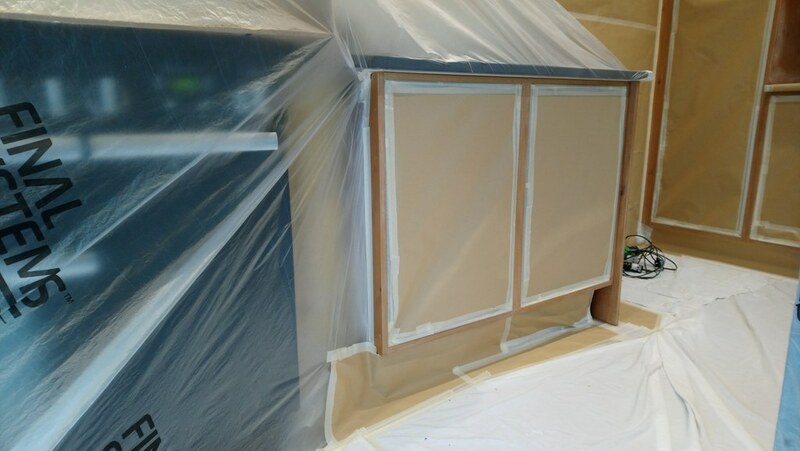 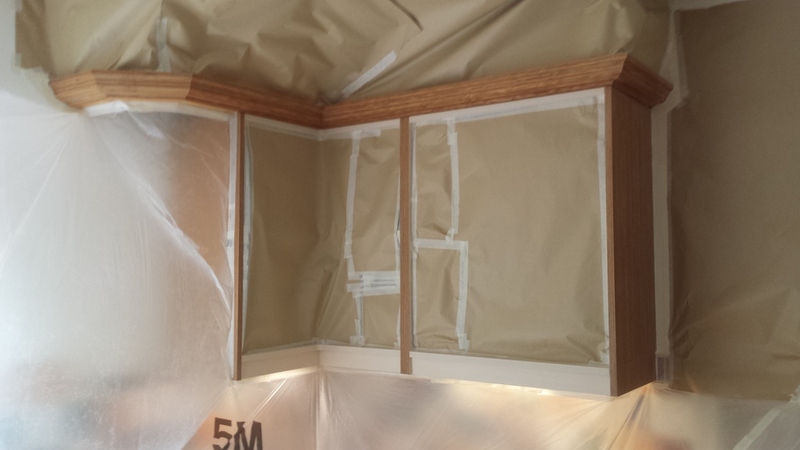 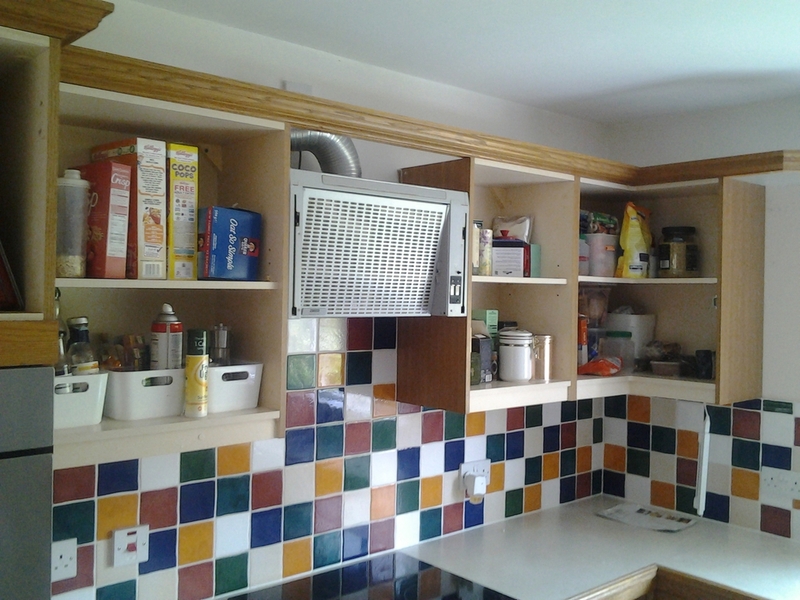 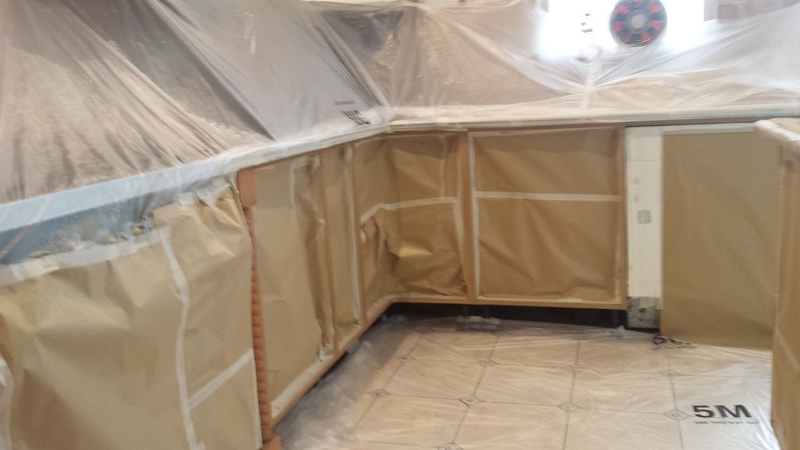 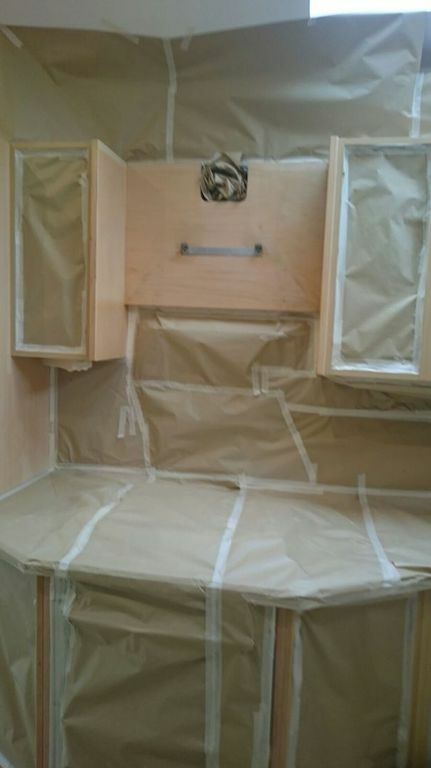 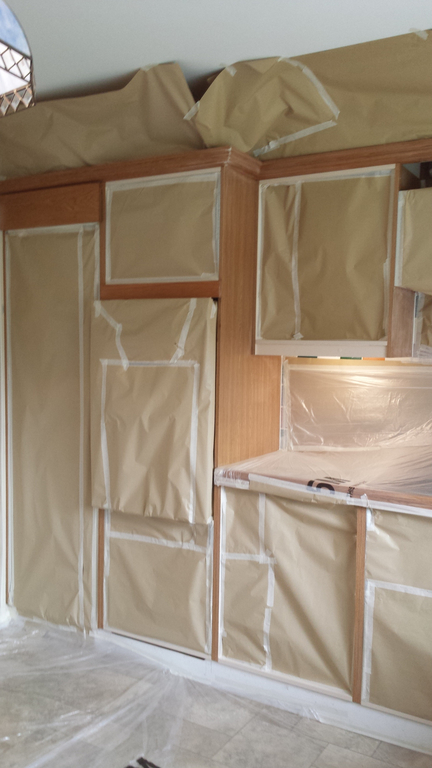 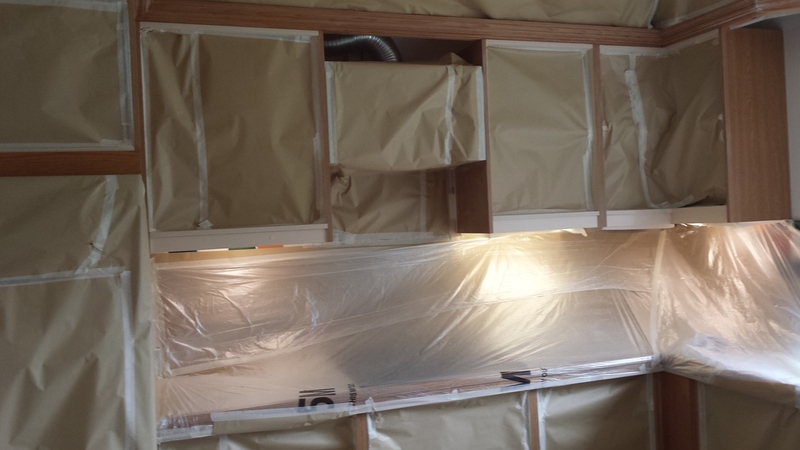 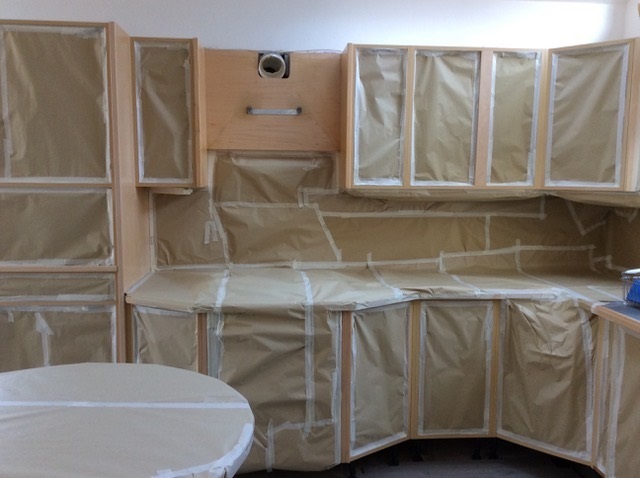 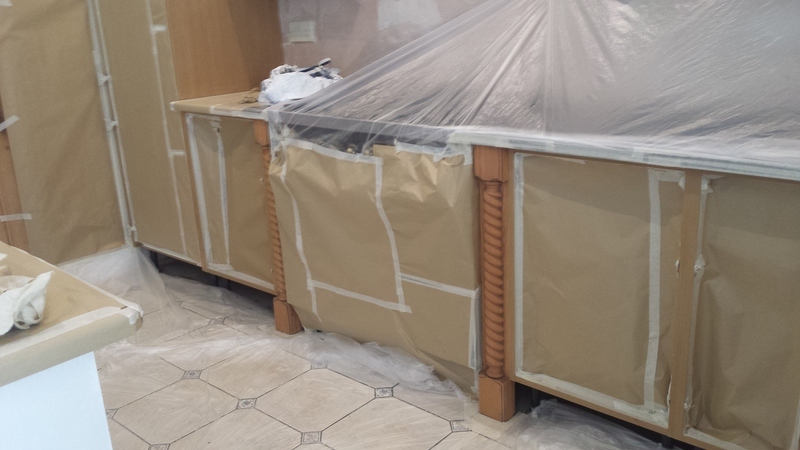 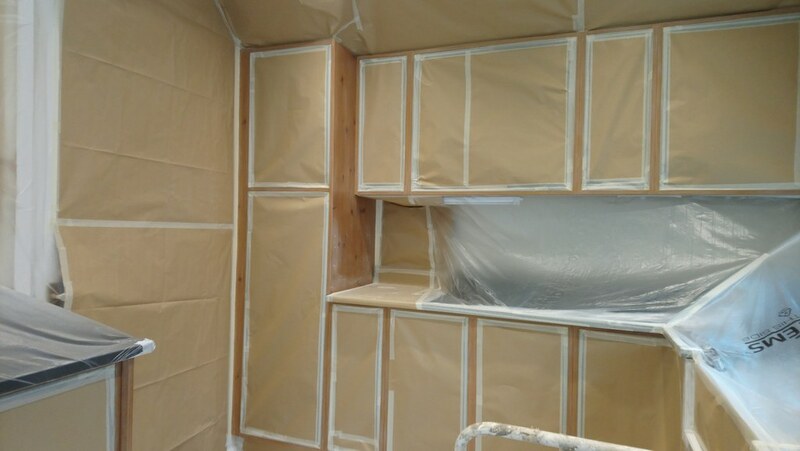 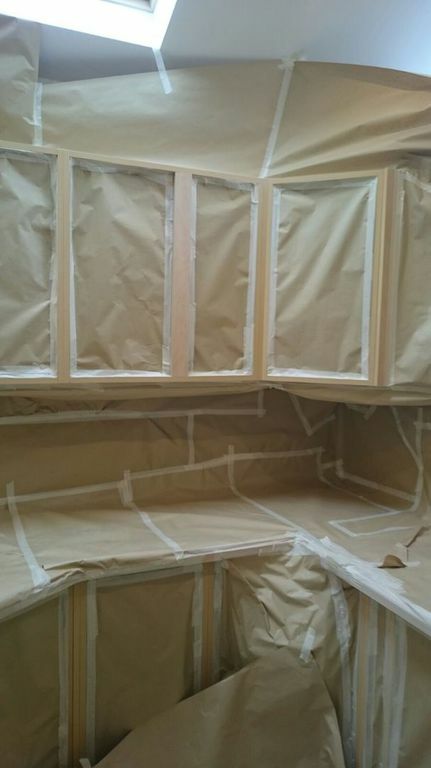 The photos show the kitchen before, during (including our team on-site spraying) and after. 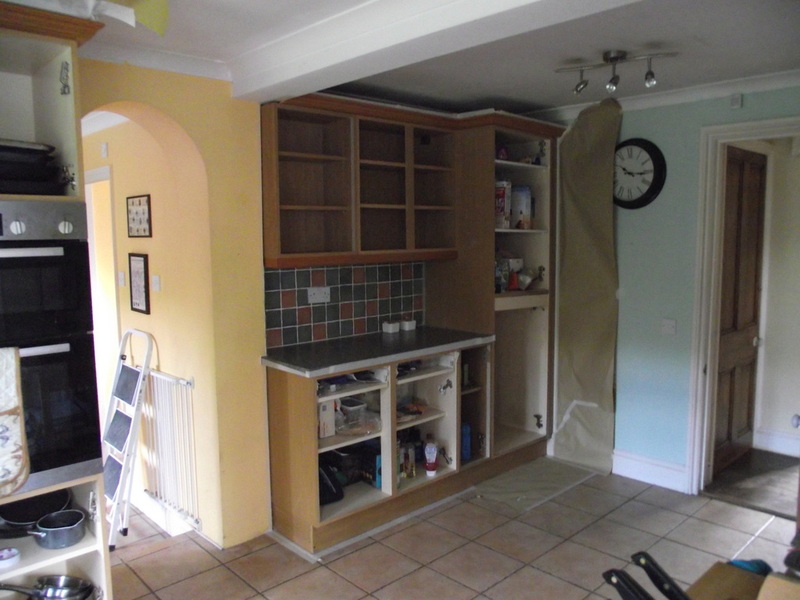 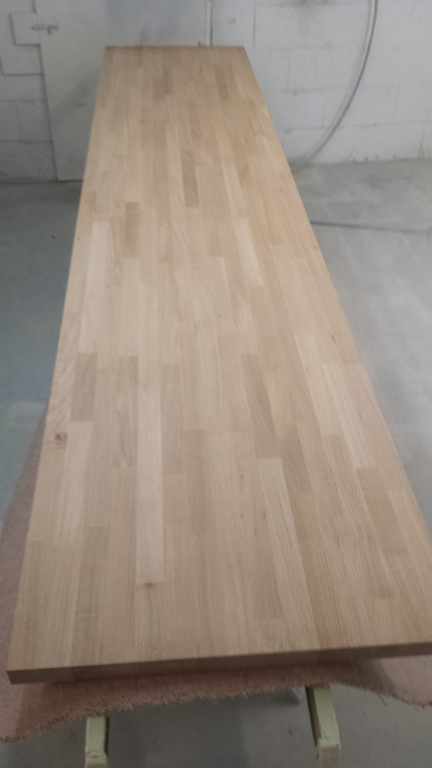 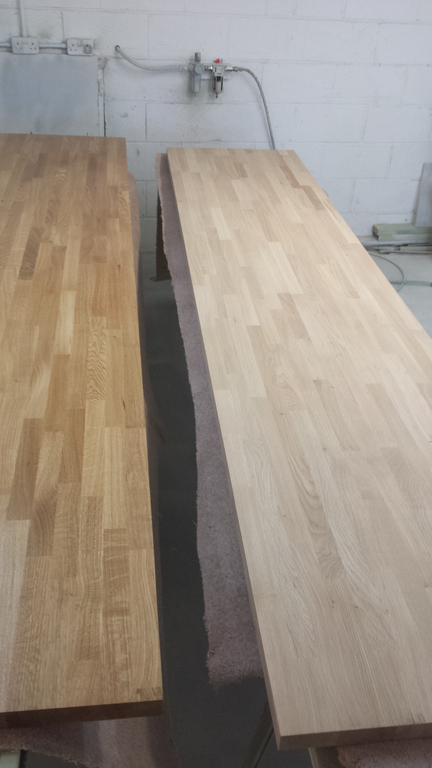 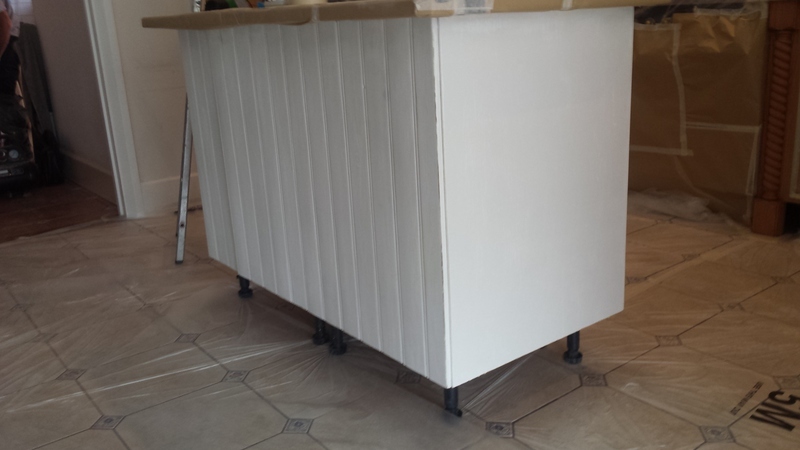 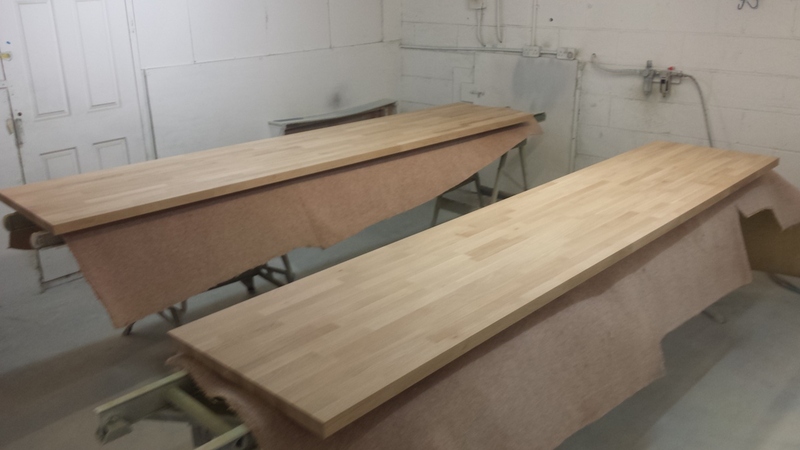 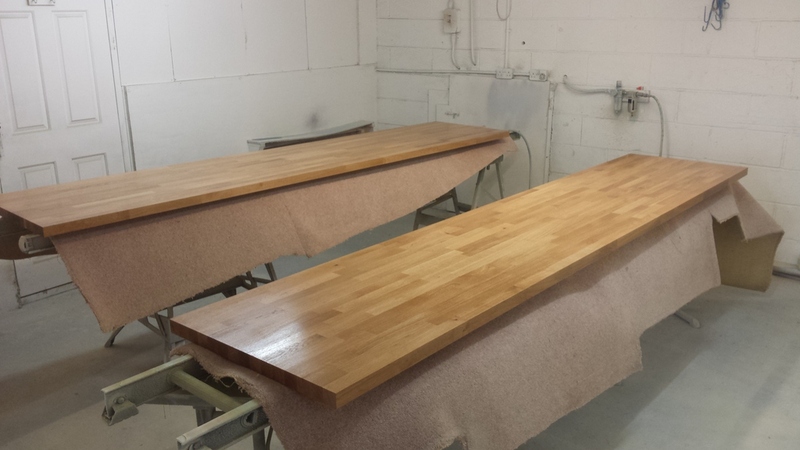 The last photo was emailed to us by our client, who are over the moon with the transformation. 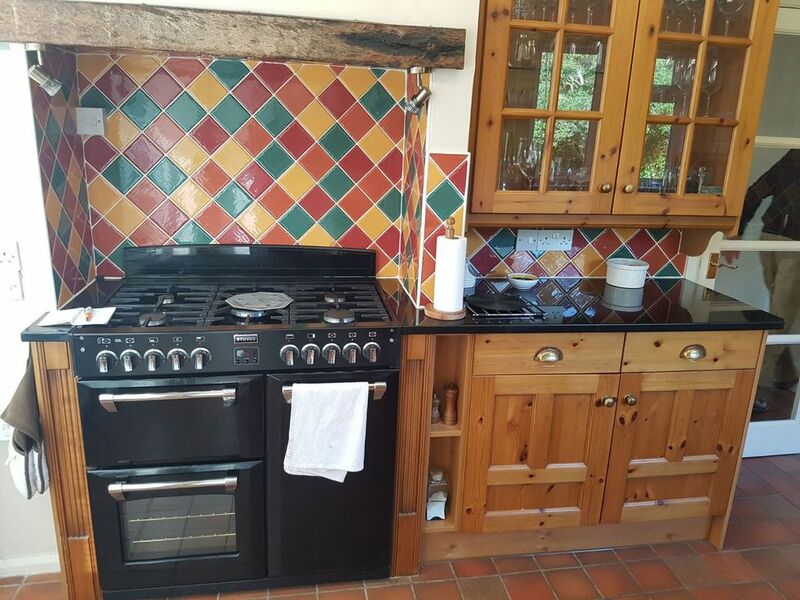 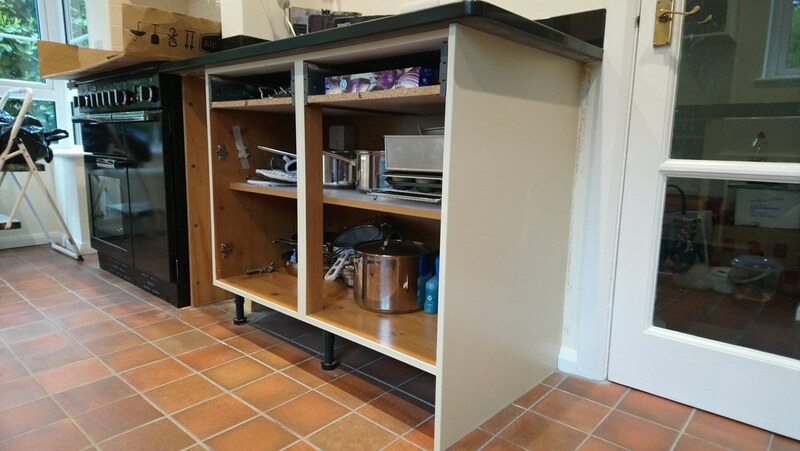 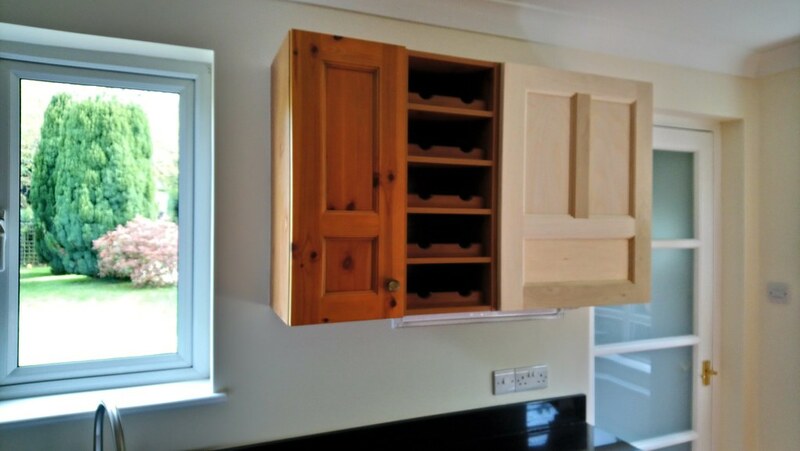 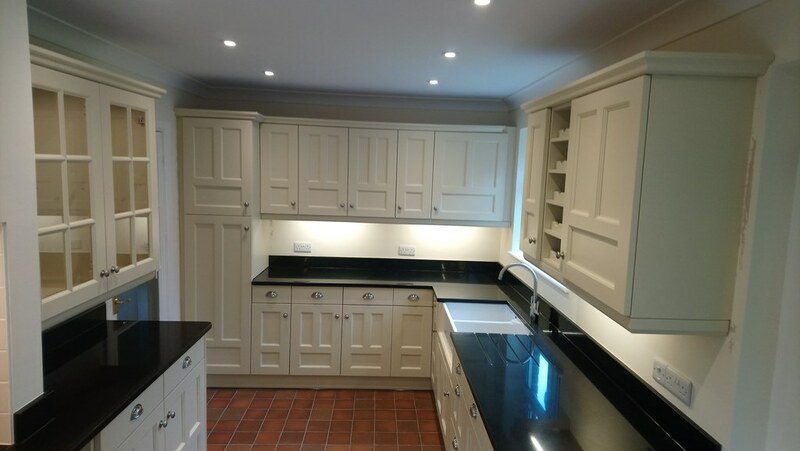 The slideshow below shows a kitchen in Bury (nr Amberley) that we transformed from a dated wooden kitchen with aging work surfaces into a beautiful white "country cottage kitchen" with stunning lacquered oak wood work tops (our lacquering service means that they do not have to be oiled annually). 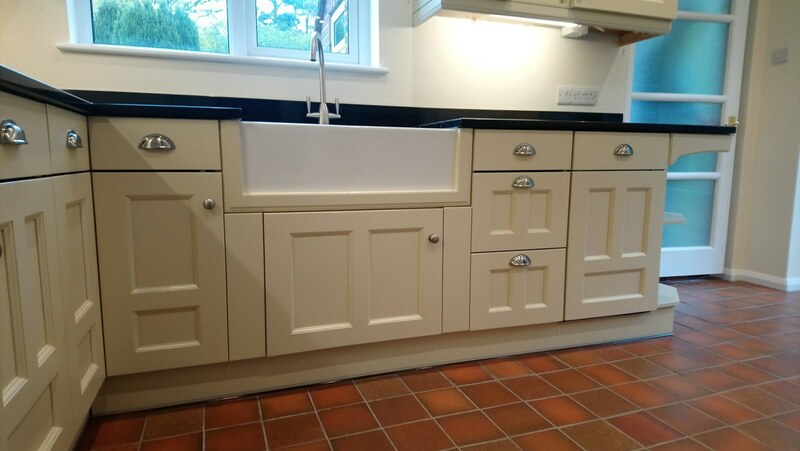 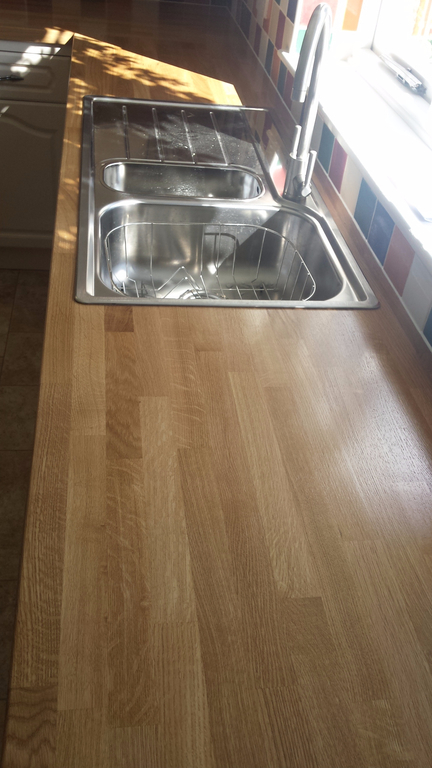 We also supplied & fitted a new sink & taps and new hinges & handles. 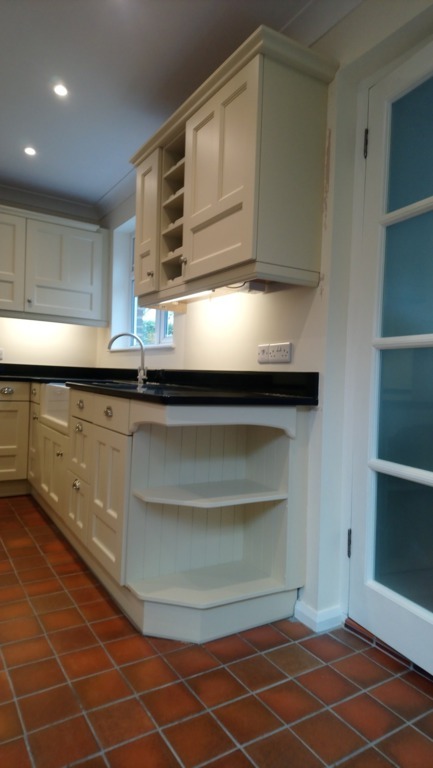 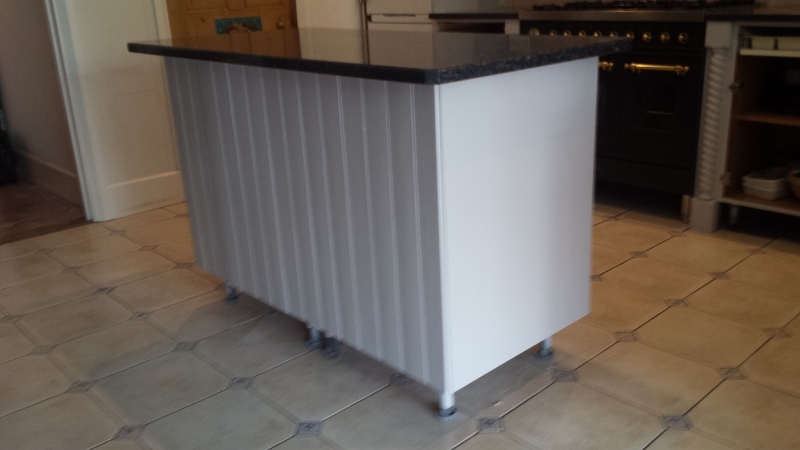 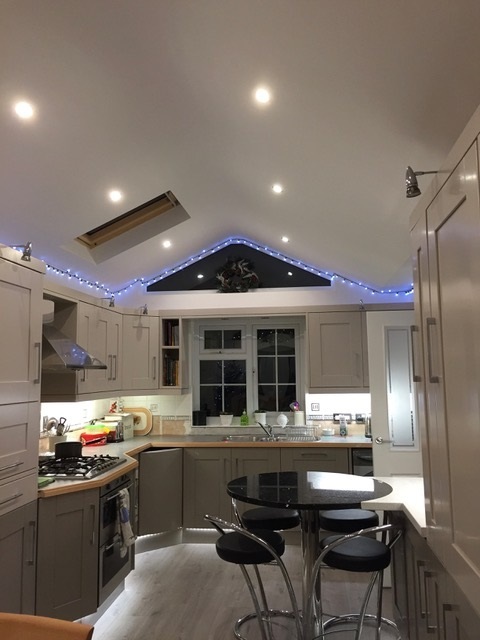 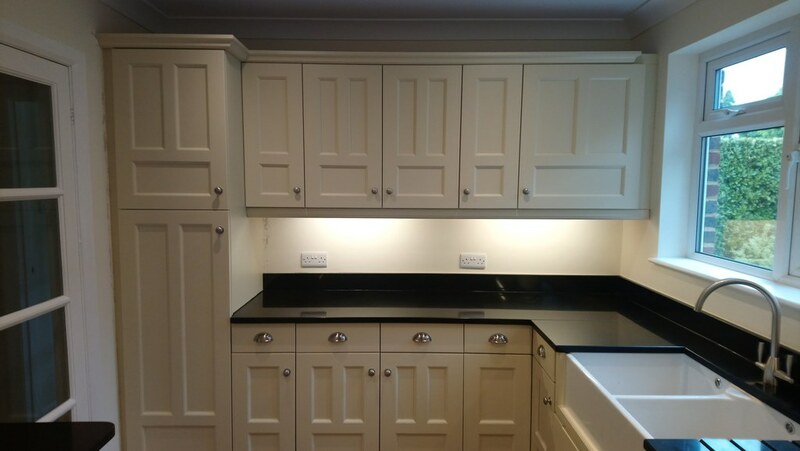 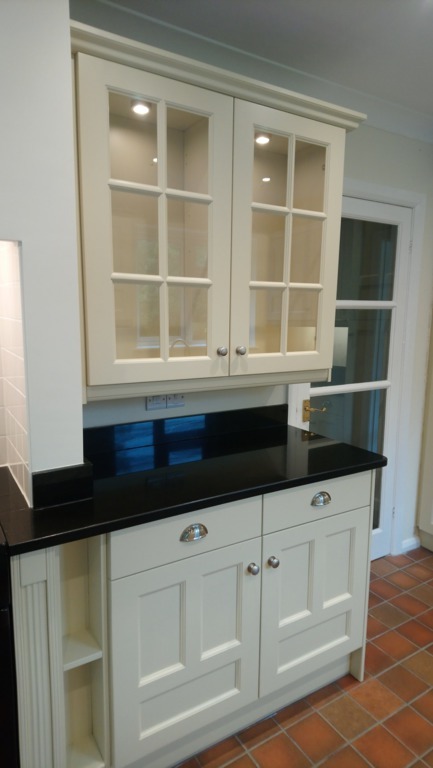 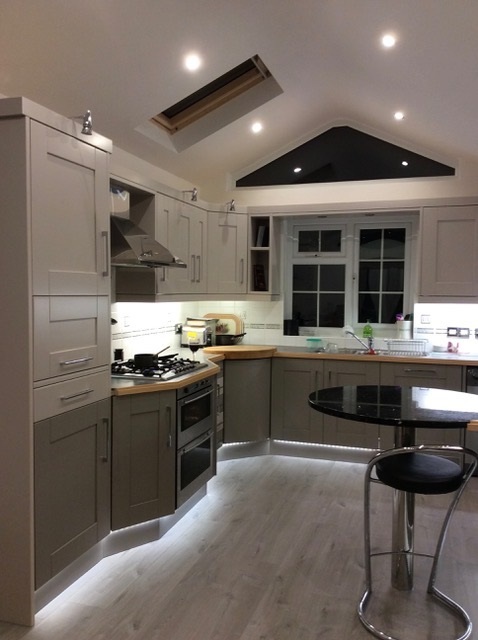 Below is a slideshow showing a kitchen in Horsham that we transformed from a dark wooden kitchen into a fresh, bright white kitchen.